There is the Maqam of sheikh Abu az-Zeitun on quite a high mountain between Arabic Beitunia and an Israeli settlement Beit Horon. On modern maps the sheikh is called Zeitun, but in the earier reports about this sanctuary the sheikh is called Abu az-Zeitun, Abu-z-Zeitun. 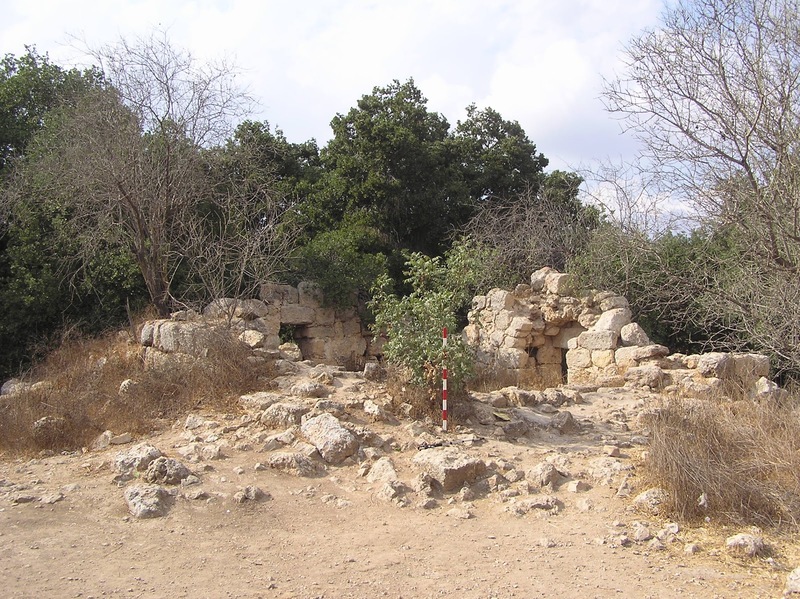 “My guide pointed to the top of the mountain southwards, where there was a welli known as Abu Zeitun,” — V. Guérin tells (Samarie II 46). 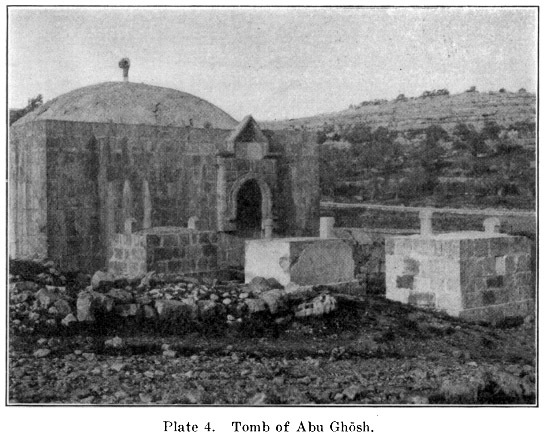 According to C. Conder, “Sheikh Abu ez-Zeitun — A mosque, with chambers for pilgrims” (SWP III, 157). Palmer states, “Sheikh Abu’z-Zeitun — The Sheikh (Sheikh's tomb) with the olive” (1881, 327). In fact, this structure is a whole complex of buildings of different purpose, which was set as time passed/over the years. 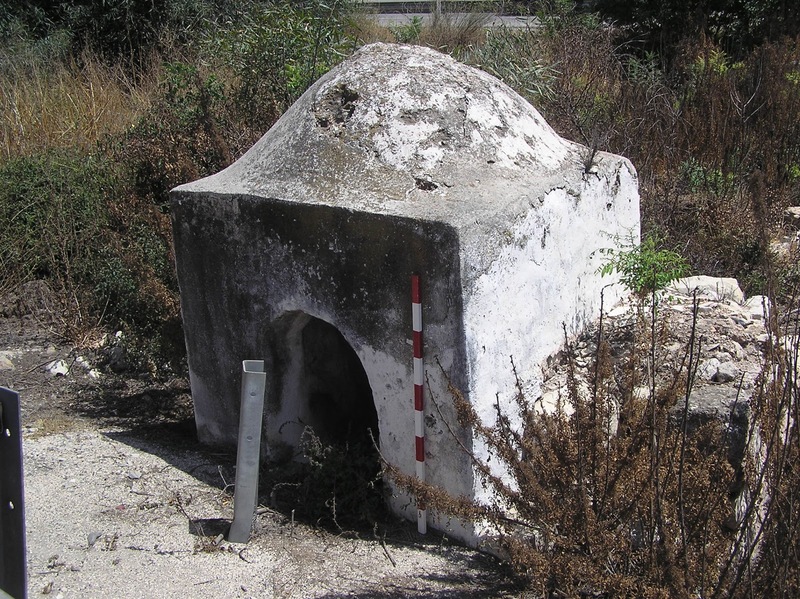 Firstly, on this place there was built a tiny maqam of a saint which was a burial domed cell (1,90 х 2.50 х 1.90 m) (A). There is a mihrab in it, but a cenotaph was not preserved. 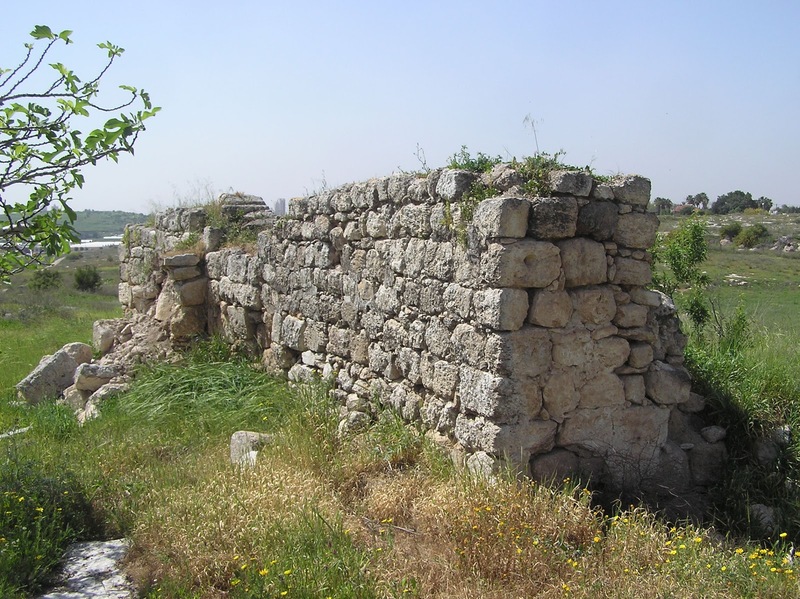 According to the blockwork (quite big blocks of different size), this building can be dated back to Ottoman period – the early 19th century. Afterwards the maqam was enlarged in the northern part, the side wall were extended from 2.50 m to 4.80 m; and a new entrance was made. Another blockwork which consisted of rectangular well cut blocks points to that fact. 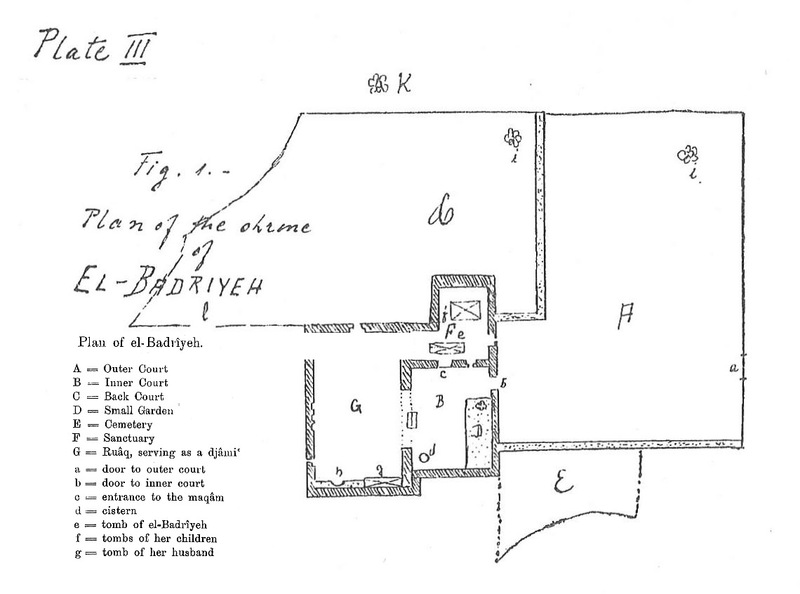 Since even extended cell could not be able to house all praying pilgrims, some time later a Prayer room (6.30 х 7.10 m) with a mihrab and arched ceiling was built on to the eastern side of the maqam (B). This annex is almost twice as high as the funeral cell. 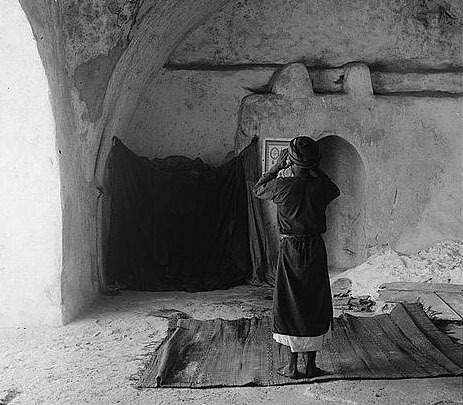 Later iwan (6.00 x 7.10 m) with a mihrab was added to the Prayer room eastwards (C). Thus the rooms of this complex have already mihrabs, and obviously numerous pilgrims can pray in each room. 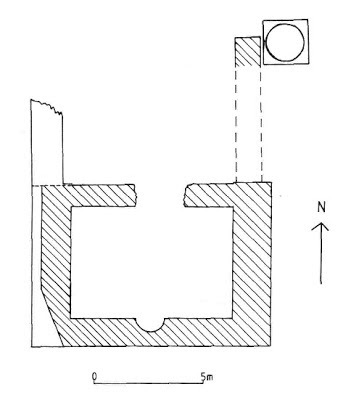 During the final stage the complex was compassed with a rectangular 25.15 x 22.00 m wall. 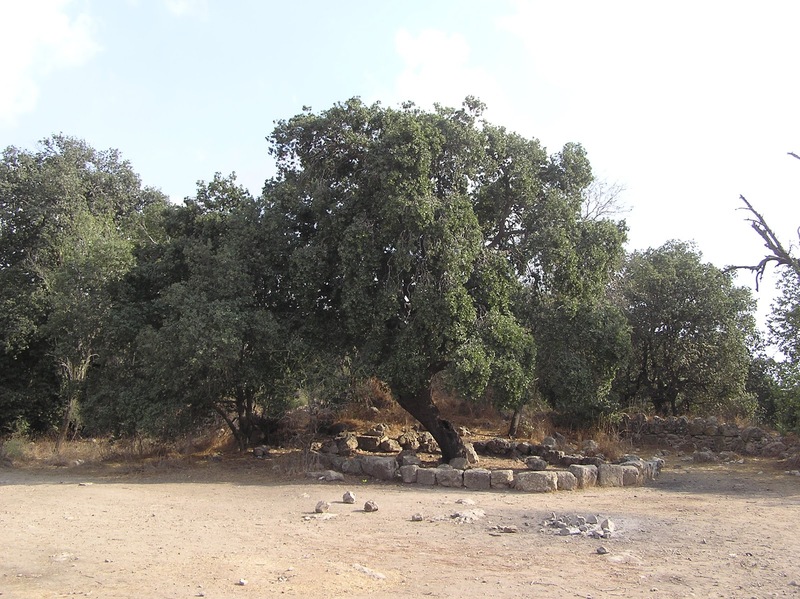 In the northern part of the complex there was a yards with a holly olive tree “Sheikh's tomb with the olive”). Now there are 4 olive trees in the yard. 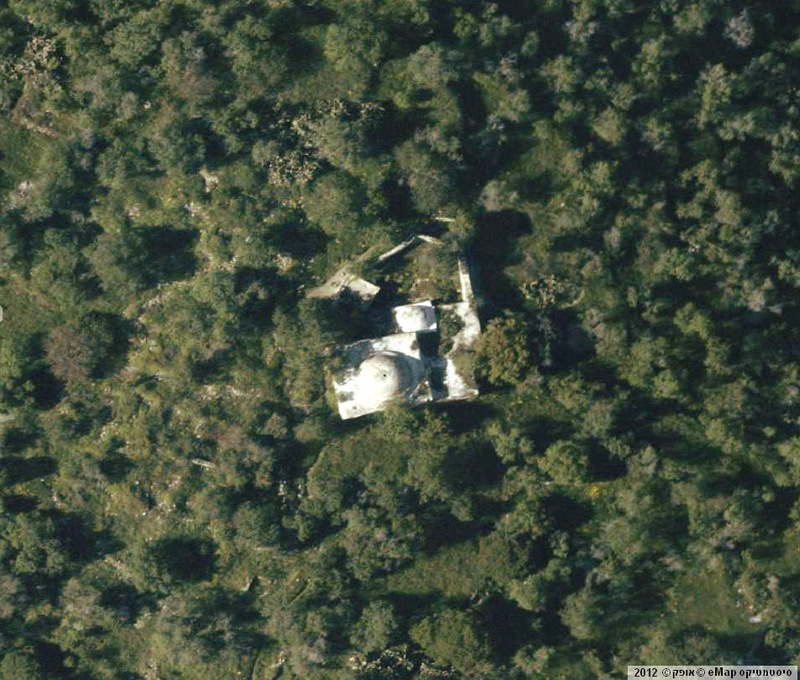 You could enter the complex through the arch roof from the eastern side, but now it is totally destroyed. 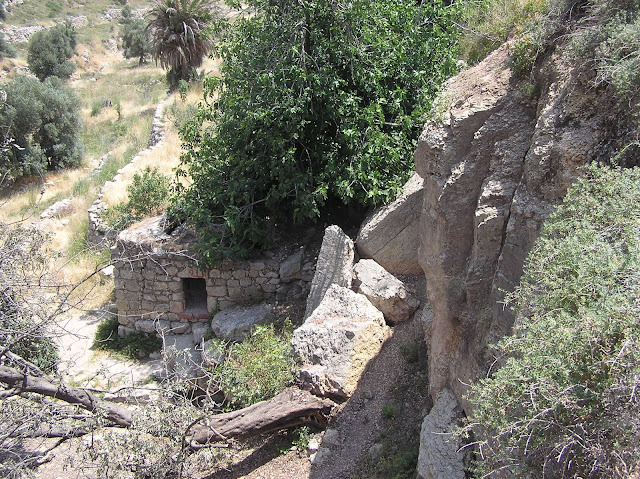 To the right from the entrance, northwards from iwan there was built zawiya – a restplace for pilgrims (7.40 x 6.50 m). It was the fourth room in the complex (D). Eastwards from the entrance to the shrine there is preserved an underground reservoir for water storage. 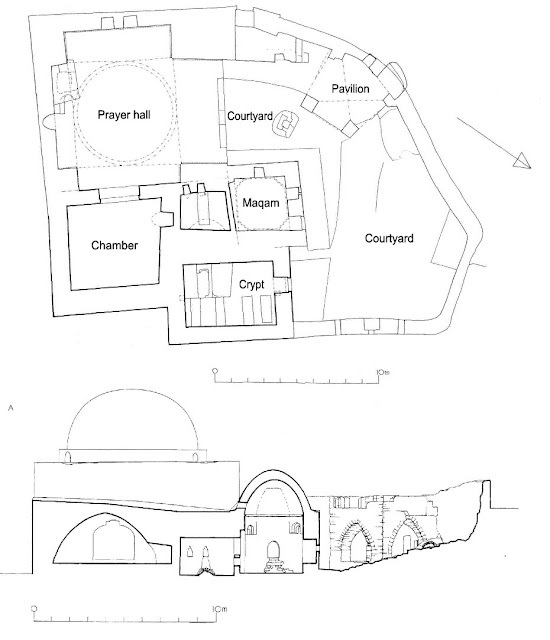 According to what C. Conder says about not the tomb of the sheikh, but about a mosque with rooms for pilgrims, the sanctuary complex has already been set by that time. During the Palestinian campaign 1917–18 the Turkish soldiers held the line at the hight of Abu az-Zeitun during a month and fought off an attack of the British army and even committed counterattacks. 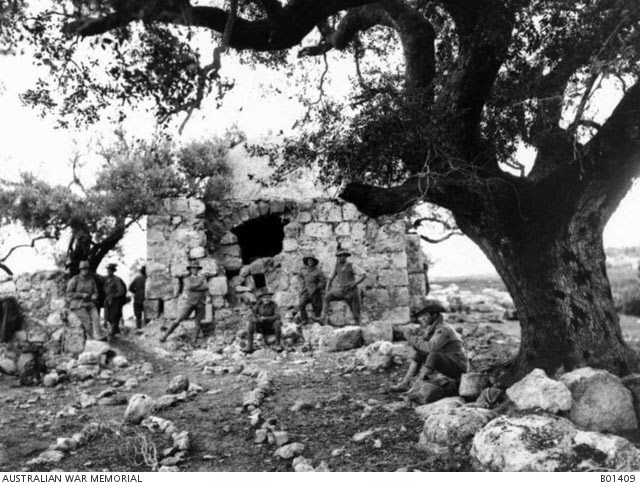 The British managed to occupy the height on the 27th of December in 1917 (Wavell 1938, 171). 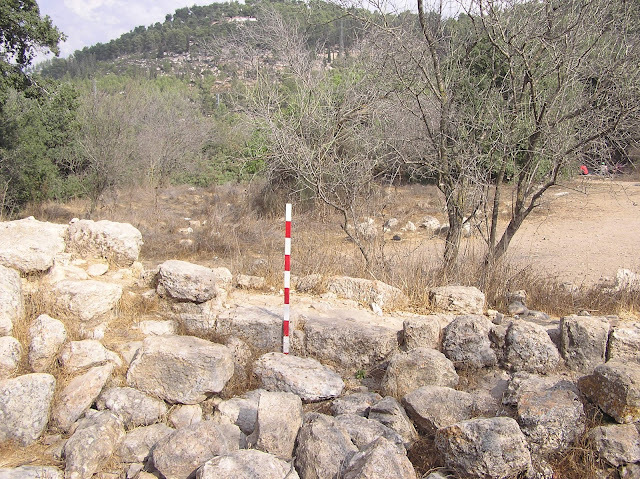 British military observers called this mountain ridge “the Zeitun Ridge, from the tomb of a sheikh on its western tip” (Grainger, 188). It's not know n whether the sanctuary of sheikh Abu az-Zeitun was damaged during that period. Now only the Prayer room of the sanctuary is fully saved. However, its western wall has dangerous cracks. 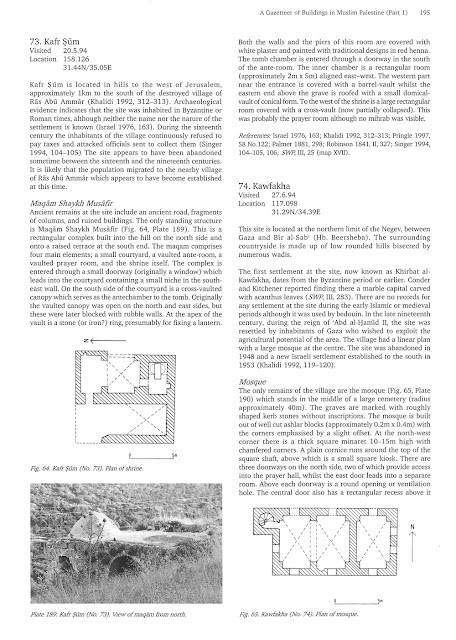 The zawiya; is almost destroyed, only outside walls, which fit to the walls of the rectangular yard, are left. 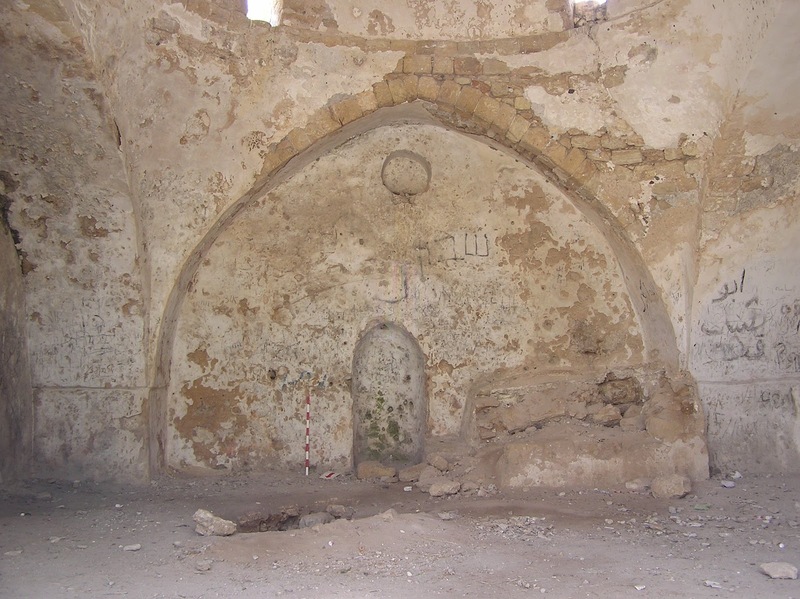 The destruction of iwan is in full swing: its ceiling has collapsed by 2/3, wreckage buried the mihrab. 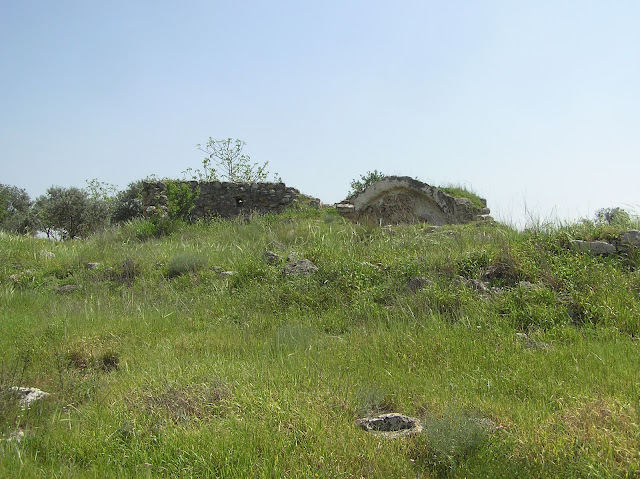 The burial chamber of sheikh Abu az-Zeitun is also rapidly destroying: the wreckage of the collapsed dome covered the floor by half. If one does not take immediate measures to conserve the building, it may be expected to be catastrophically destroyed in the nearest time. 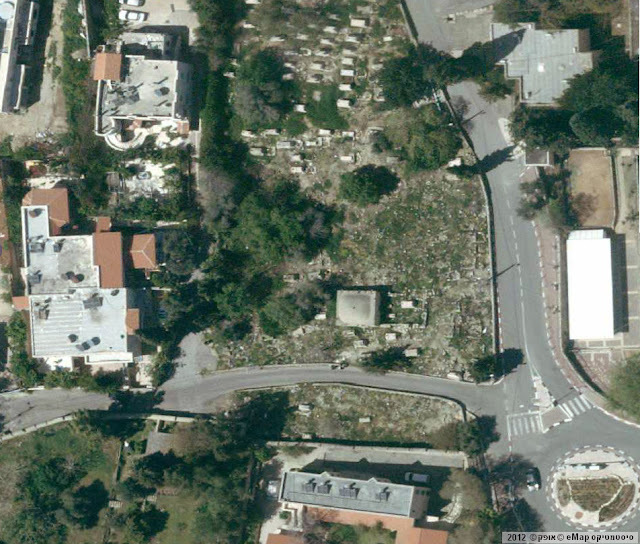 Route: You can reach the makam by asphalt road extended from a highway which ran past Beitunia. 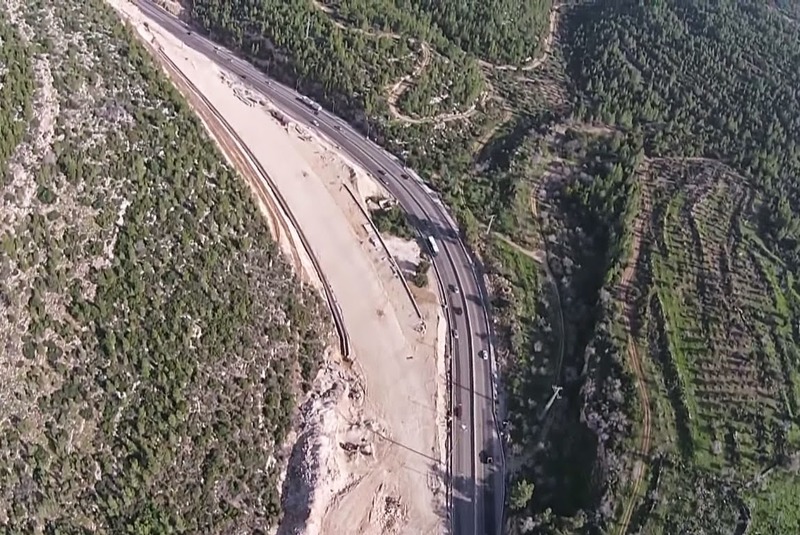 Now there is a Separation barrier and Israeli patrol road. Thus, a free access to the maqam was blocked. 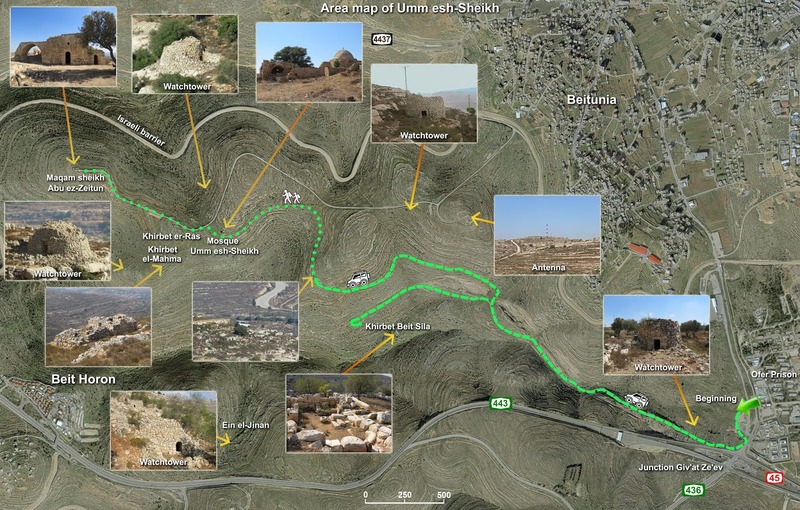 To reach the sanctuary you should take quite a difficult way, the plan is attached below. 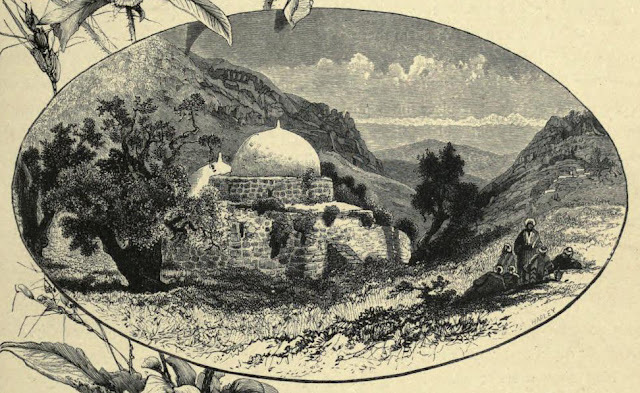 R. Macalister in 1904 described the maqam as: “North of the complex is an open, grassy space in which stands a square shrine or wely of the ordinary type. The capital of a column built upside down over the door, and here sketched (not to scale), no doubt belongs to some part of the earlier structures... 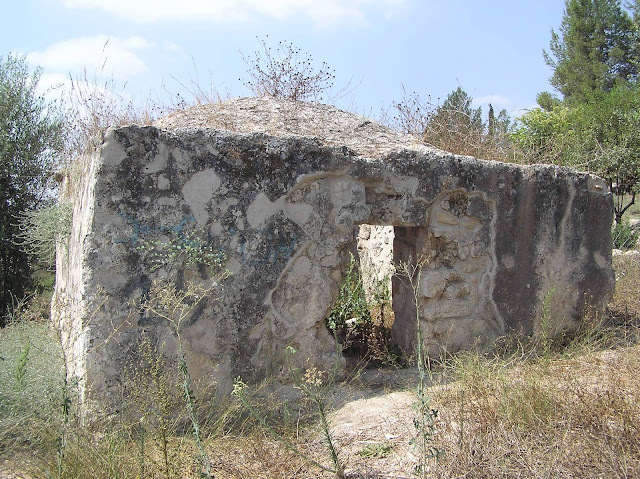 Neither can I find any traces of interments, except it be a half-effaced Muslim tomb or two within the precincts of the wely itself.” Besides that Macalister saw the Sacred Enclosure or Sacred temenos next to the maqam (Quarterly statement XXXVI 249–253). 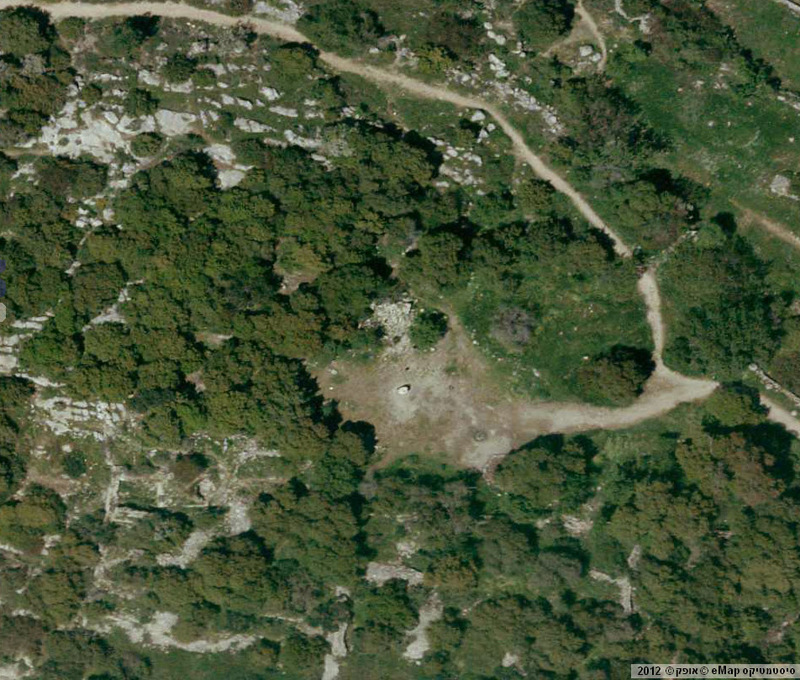 Ancient oaks are still there. 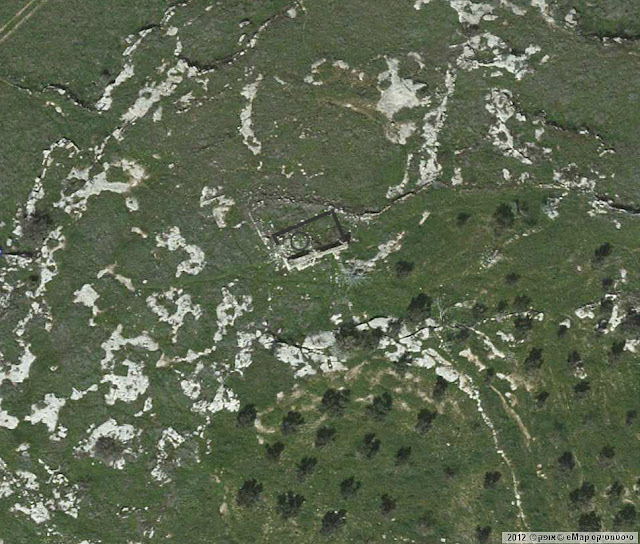 In Hebrew this place is called Hurvat Se'adim. But the maqam is in ruins. It is a perfect square with dimensions: 6.80 x 6.80 m. No chapiter is present. Extant parts of the building are: part of the north wall with the entrance; part of the western wall with a rather large window; and part of the south wall with the remainder of the mihrab. 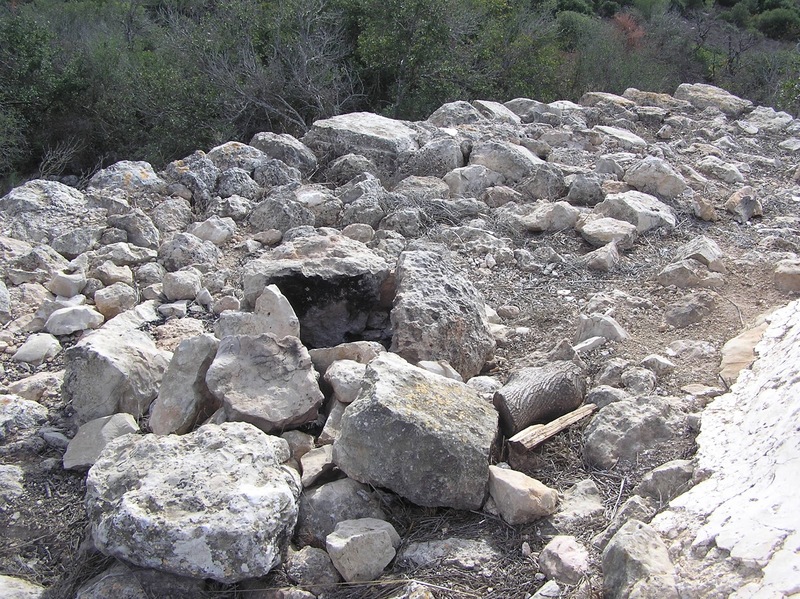 Instead of the east wall there is a pile of stones. 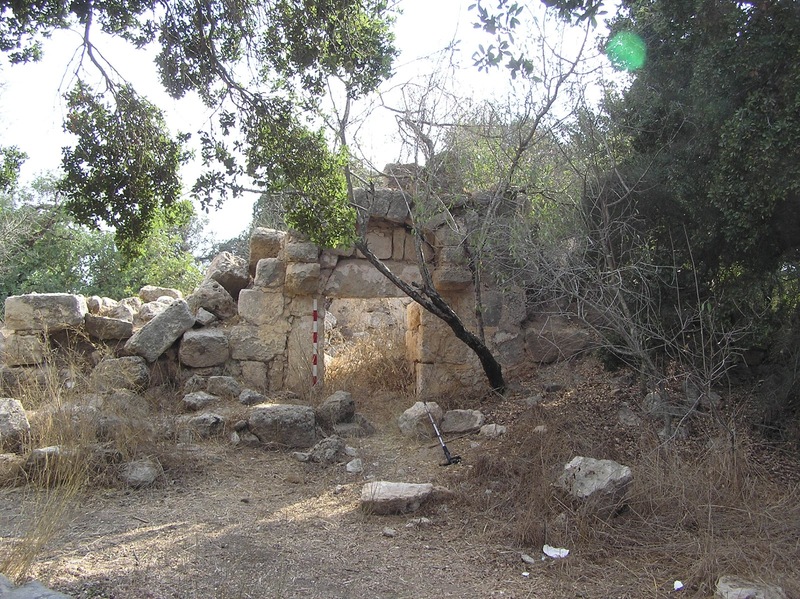 The location of cenotaph cannot be determined, because the interior is blocked up with fragments of collapsed walls and dome. The floor of the maqam is at a depth of about one meter under the present surface. Route. 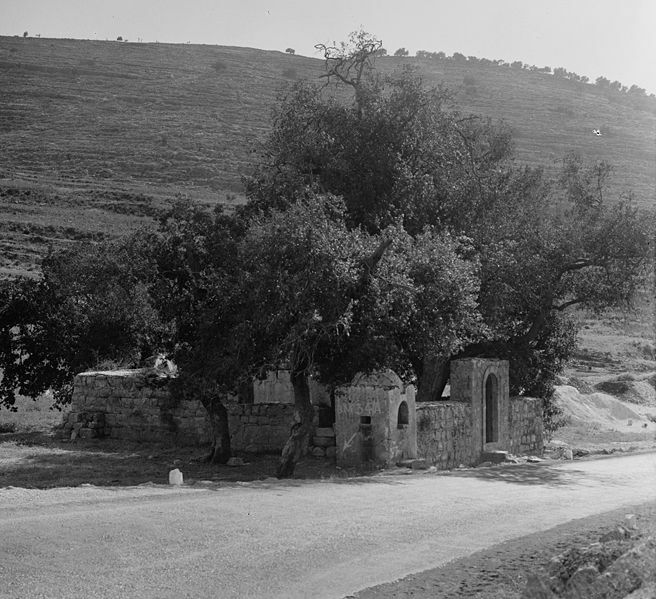 Westwards from moshav Aminadav along the paved road, past the Kennedy Memorial, further to Hurvat Se'adim, located nearly a kilometer far from the moshav. Nearby there are the ruins of the buildings from Byzantine and Early Muslim ages, and a popular tourist attraction – Shvil Ayanot (“Path of the springs”). It’s located between moshav Bar Giora and Tzur Hadassah at Khirbet Huban (Hubin, al-Hubein); Shvil Israel passes nearby. The monument has a complicated structure (A. Petersen uses the word “complex”). 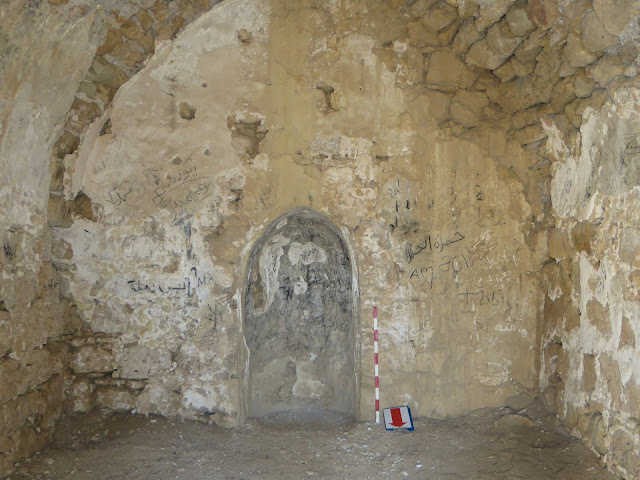 People got from the entrance hall (C) straight into the prayer room (B) with a large arch on the east side. On the walls of this room there are many modern drawings of geometrical shapes which look like plants. 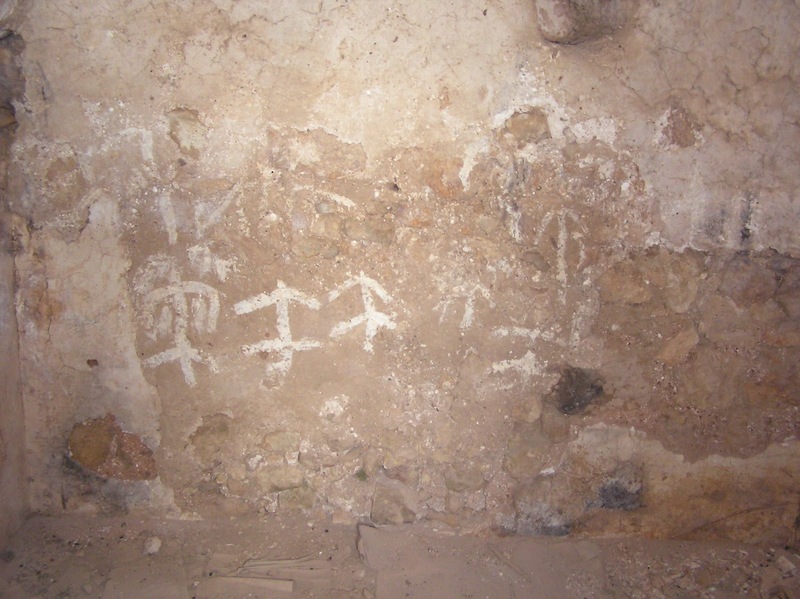 One cannot say with certainty whether Muslims left these drawings. 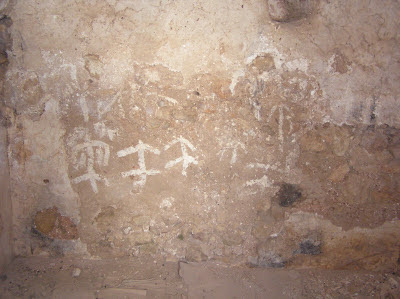 There are no inscriptions, either Arab or Jewish. 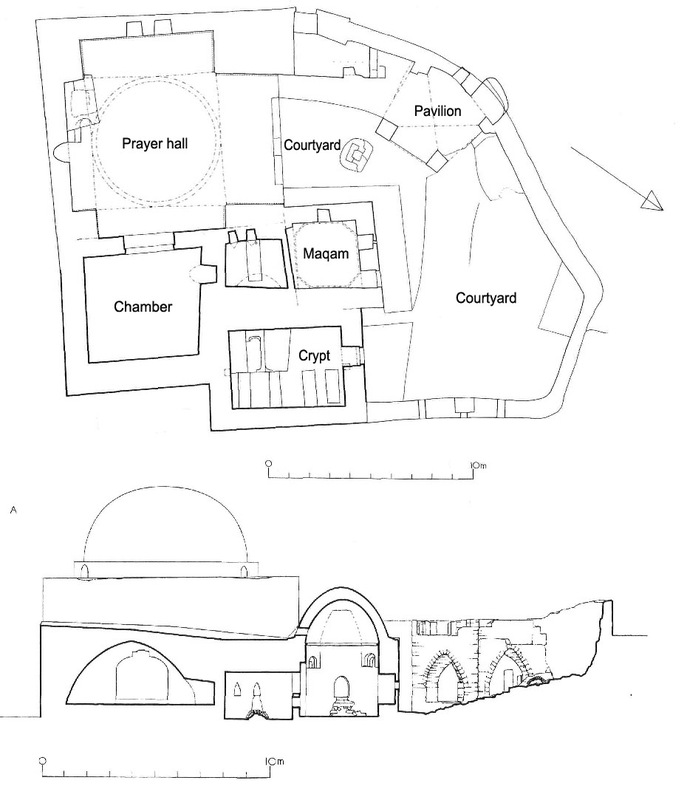 In the south wall of the prayer room there is entrance to the burial chamber (A) crowned by a dome, where once stood the cenotaph. The western side of maqam adjoins to a large room with an arched vault, which might have been a zawiya, i.e. 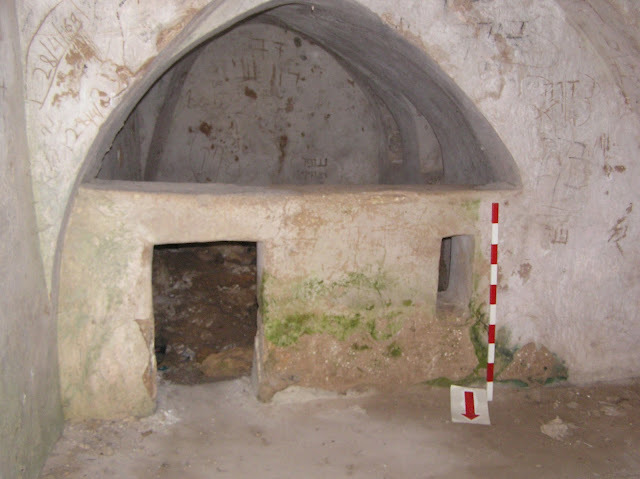 monastic cell (D). The monument is in unsatisfactory state. Not that it might face a further destruction in the nearest future, but still it needs to be preserved. 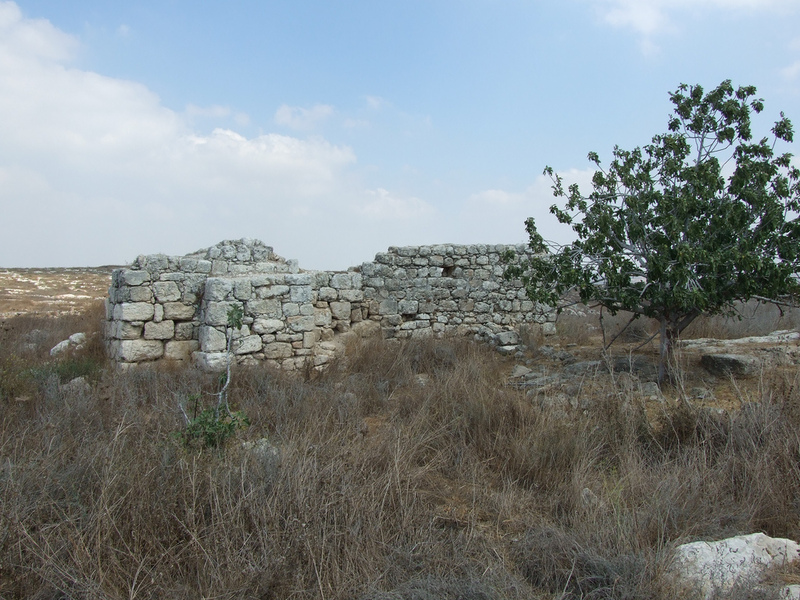 Not far from the maqam V. Guérin in 1863 saw a small Palestinian village; now only ruins remained on its place (Judee II 383). About the sheikh Ahmad al-Hubani himself we know nothing but the name. A. Petersen has a little confusion over this maqam. First of all, he uses a wrong name for it: Maqam Shaykh Musafir. Secondly, he incorrectly locates it on Khirbet Kafr Sum, which is situated at the distance of 1.5 km to the north-east from Khirbet Huban (2001, 195). 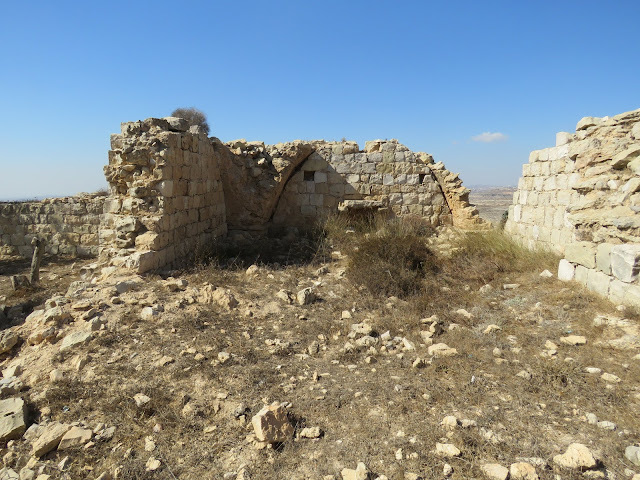 But the description of maqam, its plan and the photo in the Petersen’s book show that we are still undoubtedly talking about the tomb of sheikh Ahmad al-Hubani at Khirbet Huban. 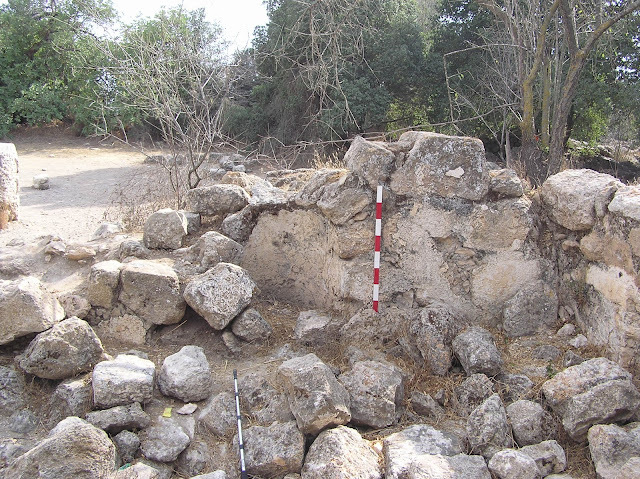 Meanwhile, at Khirbet Kafr Sum indeed there are the remains of the Muslim building, but it is not a maqam but a rural mosque. We’ll talk about it below (14. 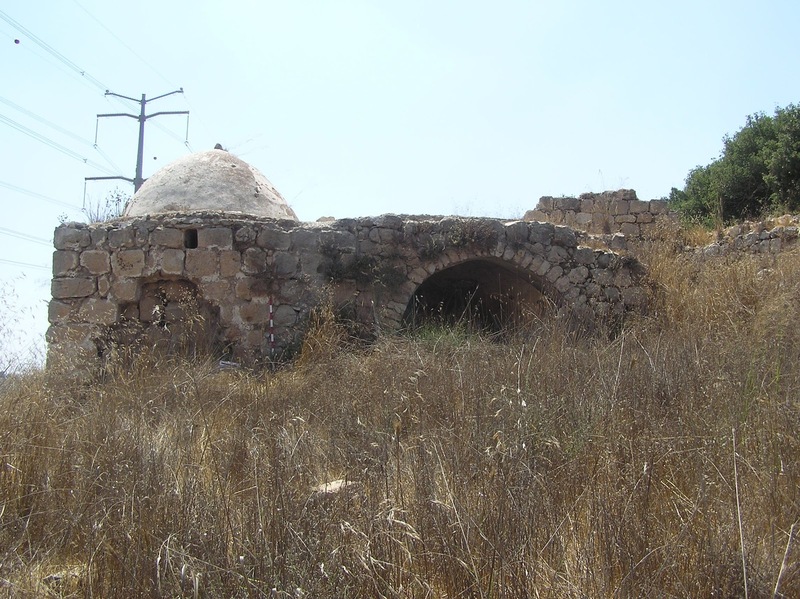 Abandoned Mosques: Mosque in Khirbet Kafr Sum). Route. Turn to the south off Route 386 between road junctions Nes Harim and Tzur Hadassah, in the direction of the Shvil Israel, then keep for about a kilometer westwards along the road 4x4 (see the map). 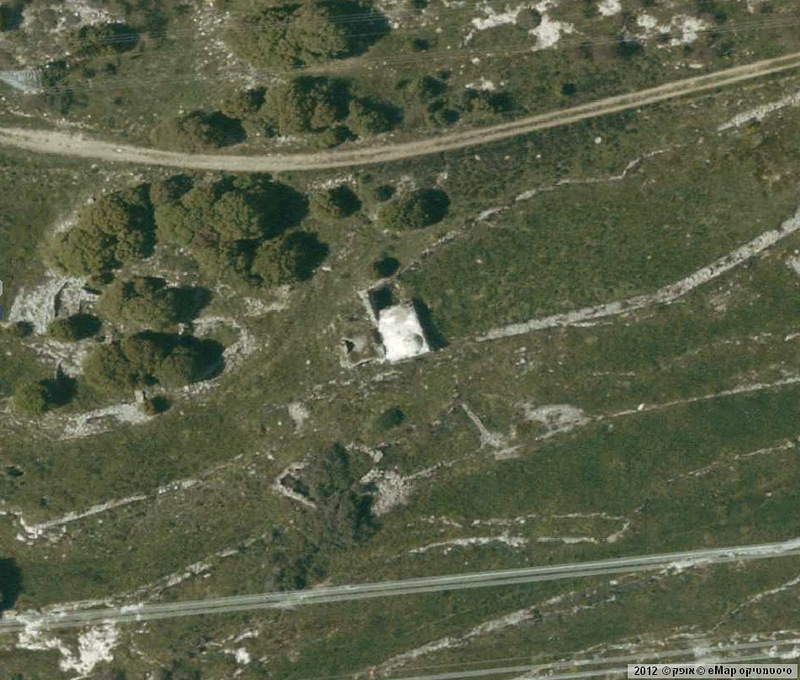 This maqam is situated not far from Kfira Spring and is located on the hillside, which is quite unusual for a maqam. A high cliff overhangs the tomb, and it almost completely nestled in the shade of a huge fig tree. Nearby are the ruins of a deserted Palestinian village. 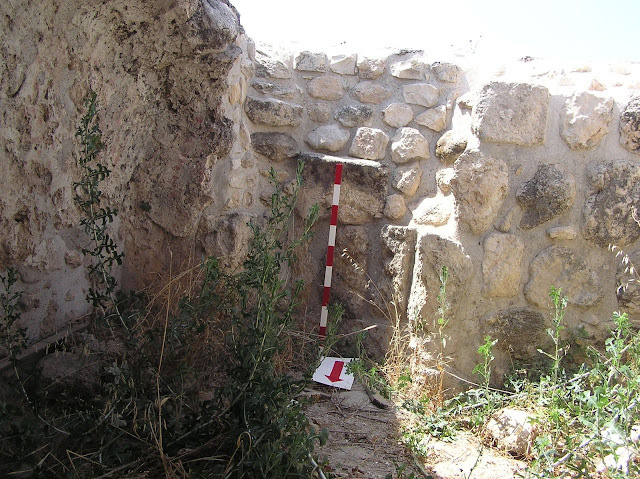 Entrance to the maqam is on the east side, on the lintel (a crossbeam above the entrance) there is a inscription in Arabic written with red paint: “Allah”. Cenotaph didn’t survive. 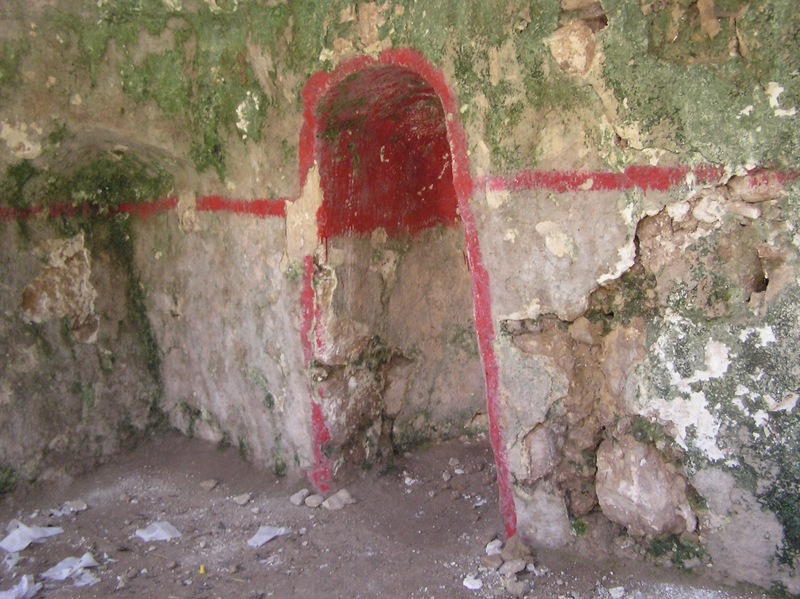 Mihrab in the south wall is painted with the same red paint, indicating that Muslims visit the shrine. 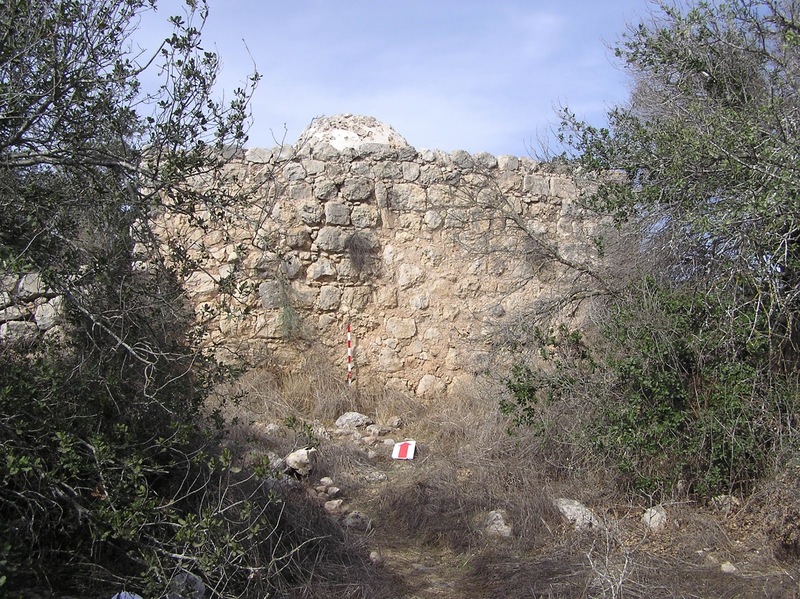 Israelis believe that they come from the Palestinian territory through some breach in the Separation barrier. Route. 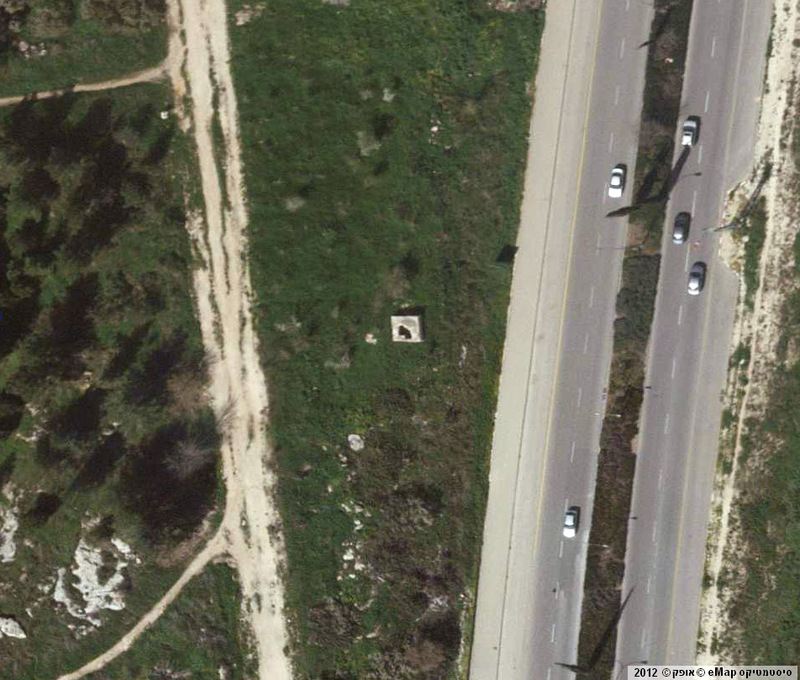 To the right of the Highway leading to Nataf, a kilometer short of the settlement, there is a path with green marks. 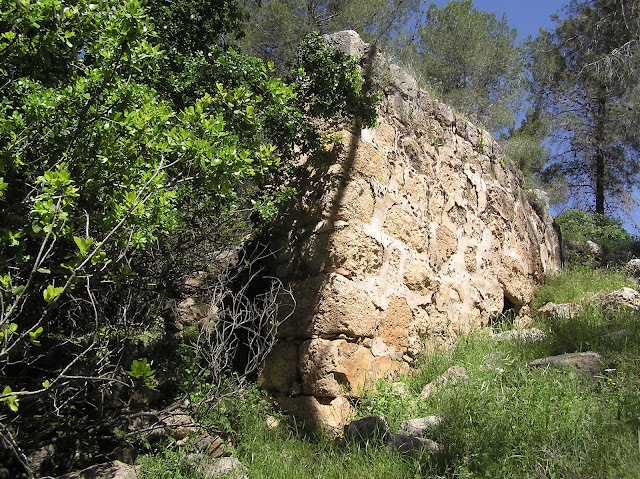 Moving along it, you'll find yourself in a gorgeous ravine where Nahal Kfira flows; and 1.5 kilometer further you’ll find ‘Ein Kfira. The required maqam is situated not far from it. 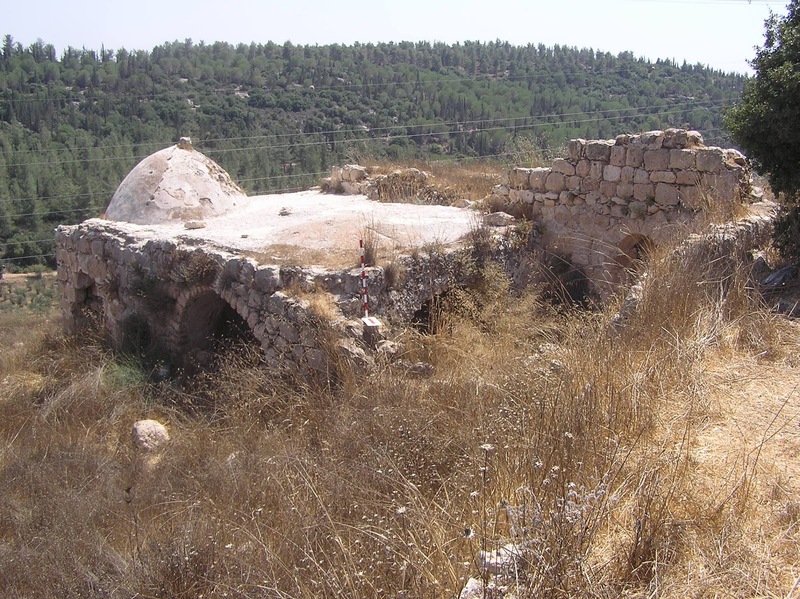 In the beginning of the 19th century, Badr ad-Din Muhammad al-Jimali came to Palestine from somewhere in Khorasan or Hejaz as a dervish and became famous as a prominent Muslim scholar and a wonder-worker. He is credited with the discovery of almost all of the springs on the outskirts of Jerusalem. He had five or eight sons, and each of them had achieved something in the field of faith. His daughters-healers Badriya, Humaidiya and Salamiya were also extremely famous. Sheikh Badr died in 1253 and was buried in the village which after that was named Deir ash-Sheikh – “The residence of a sheikh.” According to the legend all the holy men and even animals visited his grave. 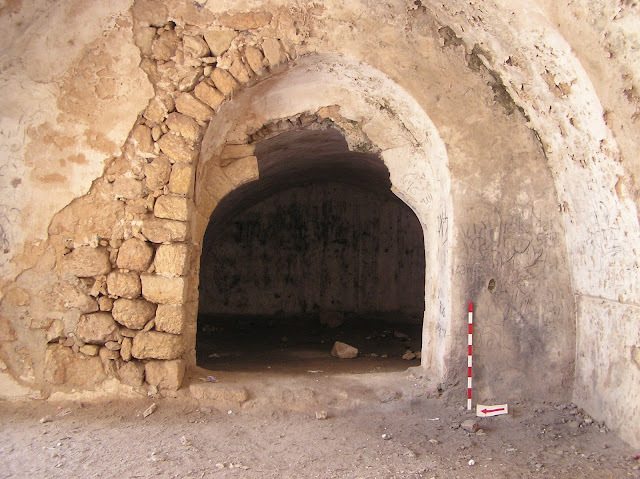 The spacious prayer hall with a large arch is adjacent to a small maqam of almost cubic shape (5.15 x 4.30 x 2.90 m). Cenotaph of a sheikh was in a special arched recess in the south wall of the maqam and was separated by a stone wall one meter high. Up until 1948 the tomb of sheikh Badr experienced a great fame and was the place of pilgrimage. 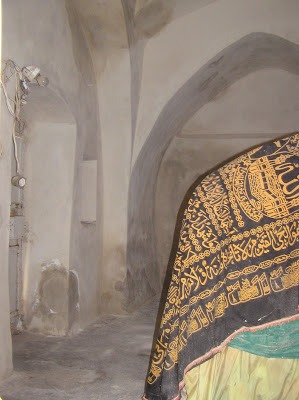 A layer of white plaster is still present on the walls of the maqam. After examining Deir ash-Sheikh in 1993 A. Petersen came to the conclusion that the religious complex had been developing for hundreds of years, but the oldest part of it is the crypt located in the south-eastern part of the complex. There are several tombstones in this crypt organized in two rows. 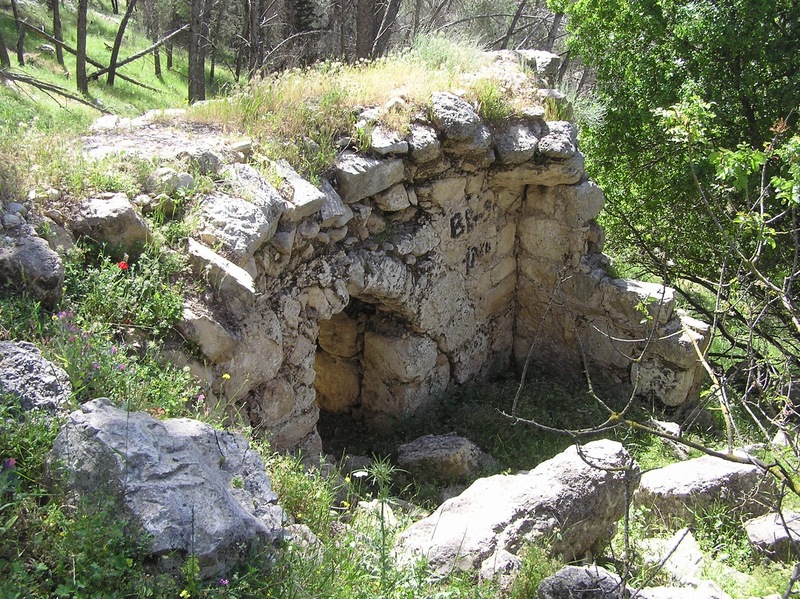 Ogive indicates, perhaps, the Crusaders period. 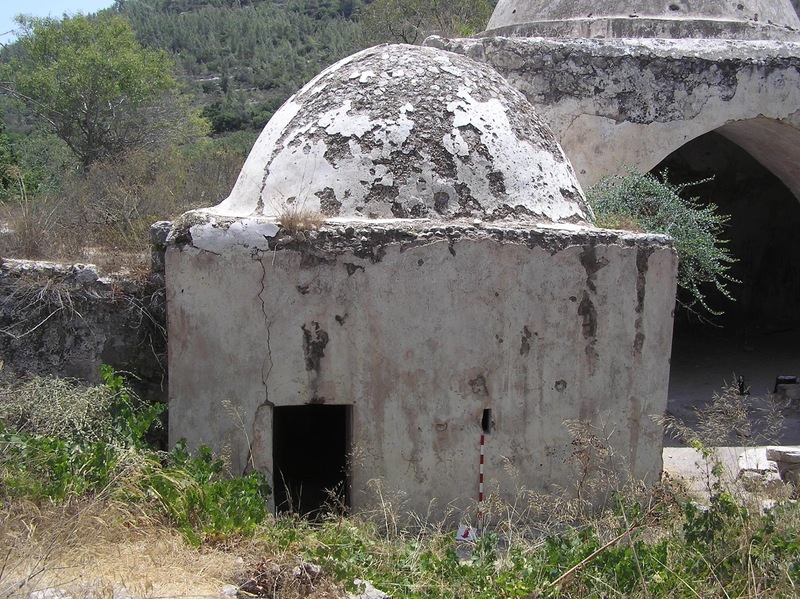 At the second stage of construction the maqam of sheikh Badr was built. 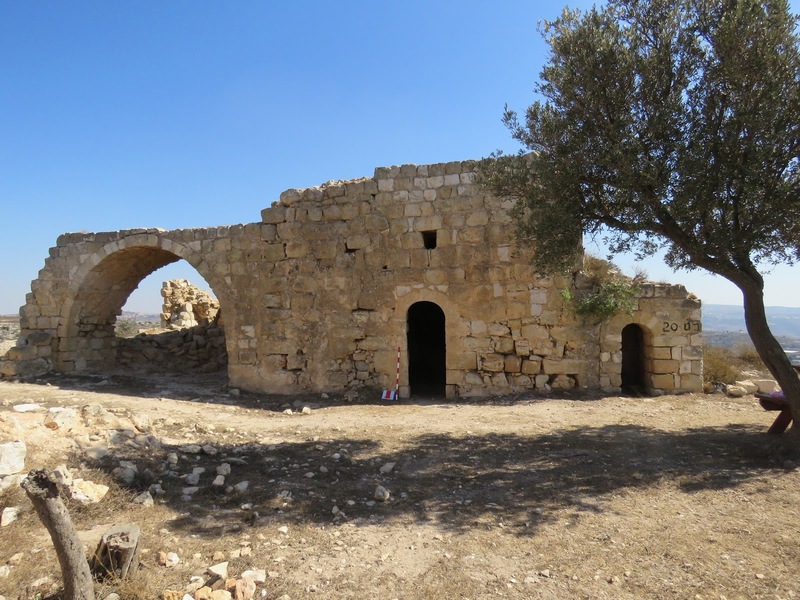 The last to arise was a prayer hall, which is located in the southwest corner of the complex and is the largest structure of the Mamluk period, or the beginning of the Ottoman Empire (2001, 138). Route. To get to the ruins of the Arab village Deir ash-Sheikh is not an easy task. 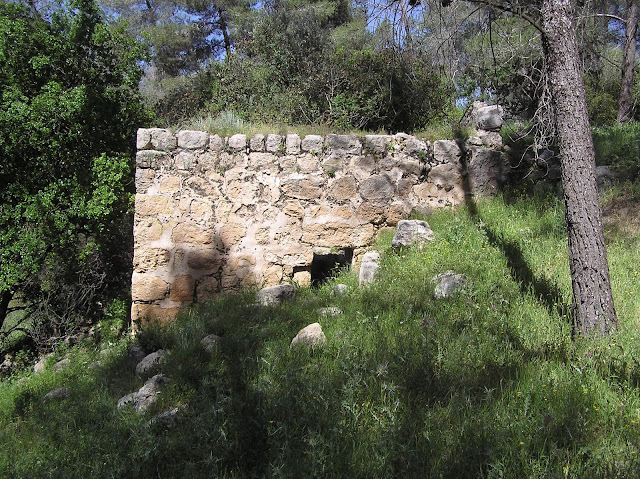 One’d better pull off Route 386 at the Rephaim bridge, drive along Derech Sorek till Bar Giora railway station, and then walk up the path with blue marks for about 800 meters. It took us half an hour to climb it. 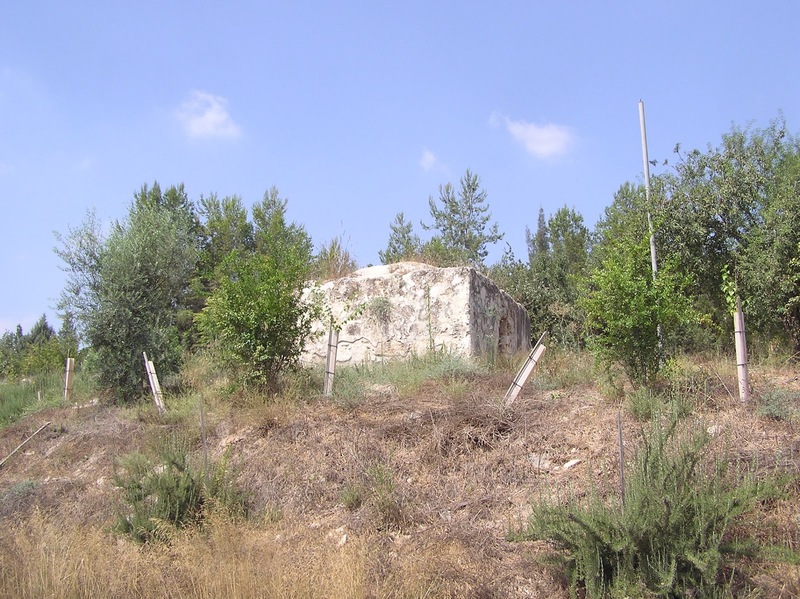 It is interesting that the first Israeli mountaineers reached the peak of the Mount Giora only in the early 1980s, and it wasn’t until 1985 that this Muslim tomb was charted. This structure can hardly be called a tower. 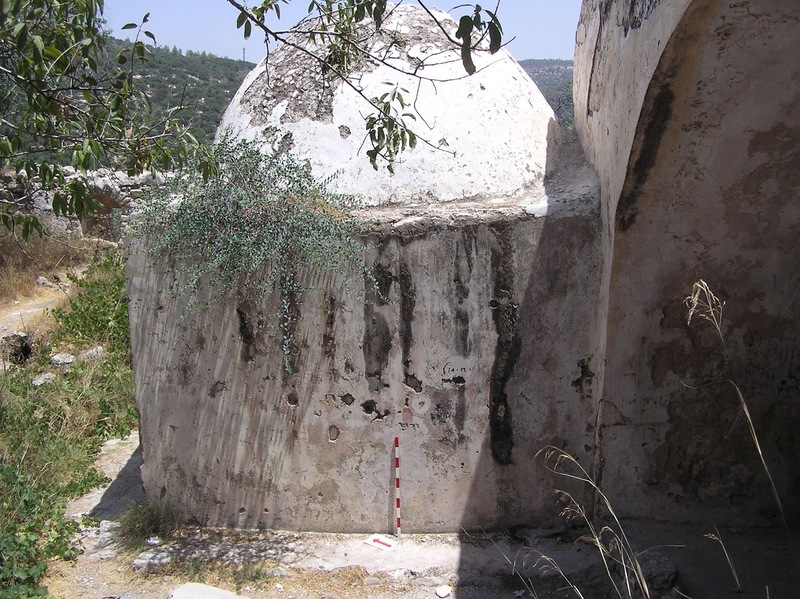 The west side of the maqam (7.50 x 7.30 x 3.70 m) is adjacent to a small annex (7.50 x 5.0 m) – a sort of a little courtyard. Its walls used to be partly made of large stone blocks. Now these walls are almost completely destroyed. The entrance to the maqam is on the same west side. Above the entrance there is a massive lintel. Walls of the maqam are up to 1.70 m thick. 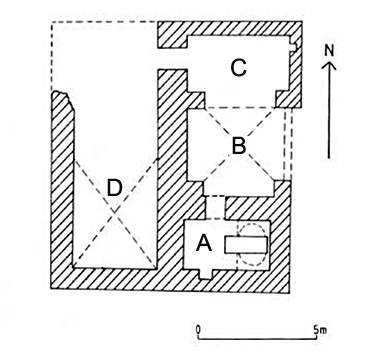 The floor of the burial chamber is 1.30 m lower than the surface of the entrance, but there are no steps at all. In the room with a vaulted ceiling there is no mihrab or cenotaph. 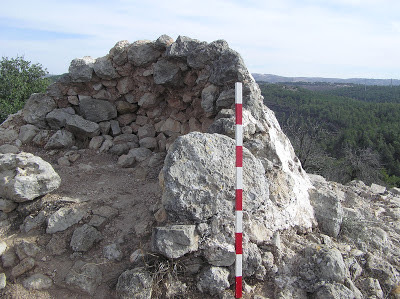 In the north wall there is a small window. 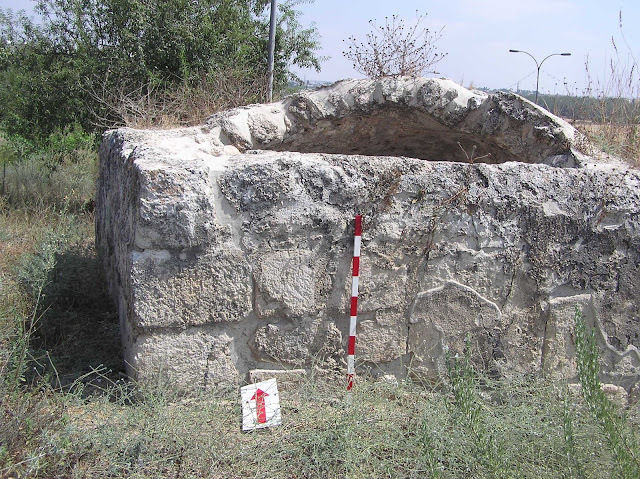 Strictly speaking, the only reason that allows to classify this strange structure as a maqam is a dome on the top of it, more than ¾ of which is destroyed. Those who had a barbecue here knew that they’d got on the Muslim shrine, because as the Parks authority board with the information about this object stands on the path. Route. Turn left (north) off Route 386 Tzur Hadassah road junction, near a fire station, and keep eastwards for about a kilometer along a dirt road, partially coinciding with Shvil Israel. 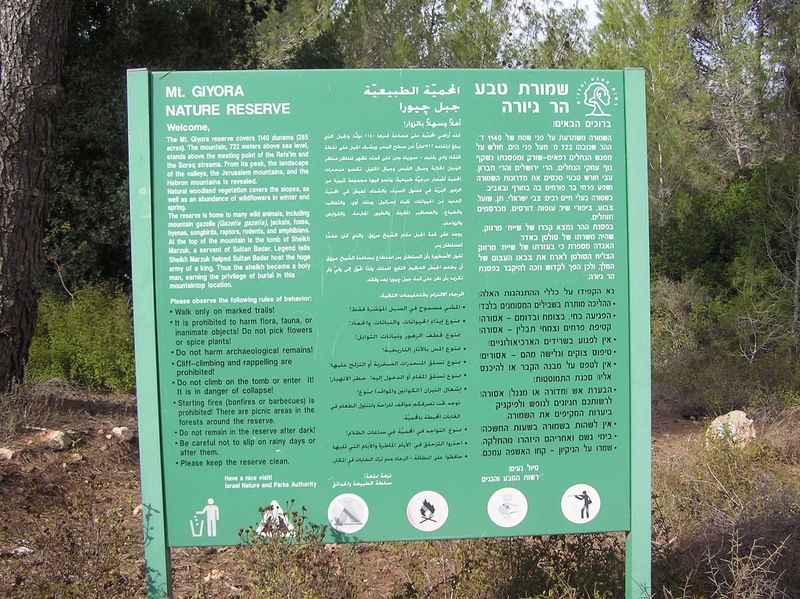 Then turn to the north-west, to the road 4x4 leading to Mount Giora. Move along the red marks. 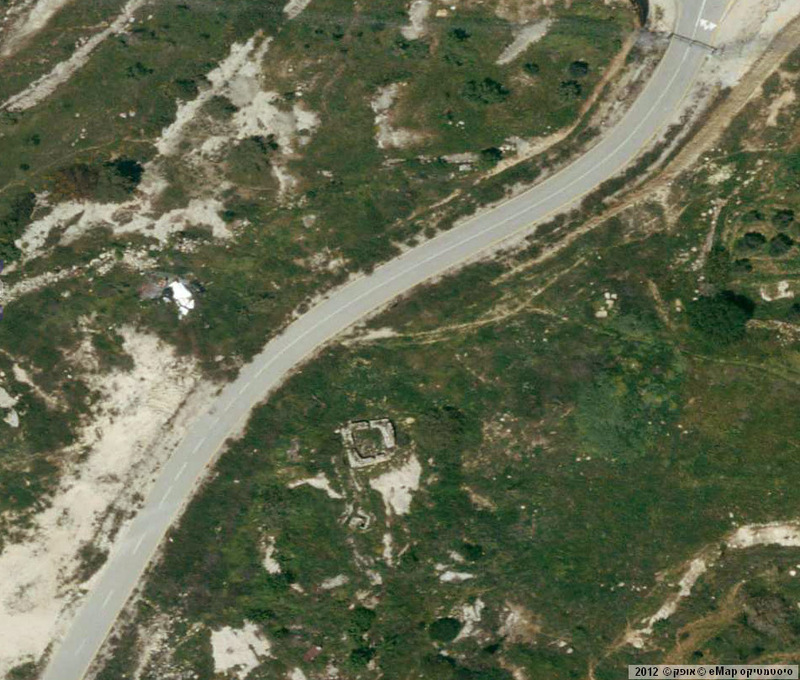 500 m short of the top of the road turns right and goes down again. Here you can leave your car and walk up the path with green marks to the top of the Mount Giora where the maqam is. The path is of high complexity, only trained people can manage it. 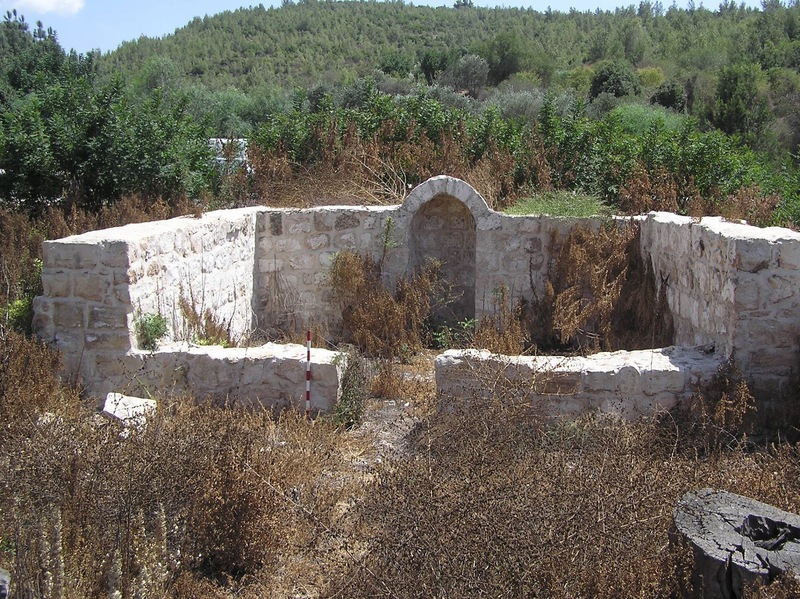 The building is described in details by M. Sharon: "The old cemetery of village [Abu Ghosh] is located to the north of the Benedictine convent. 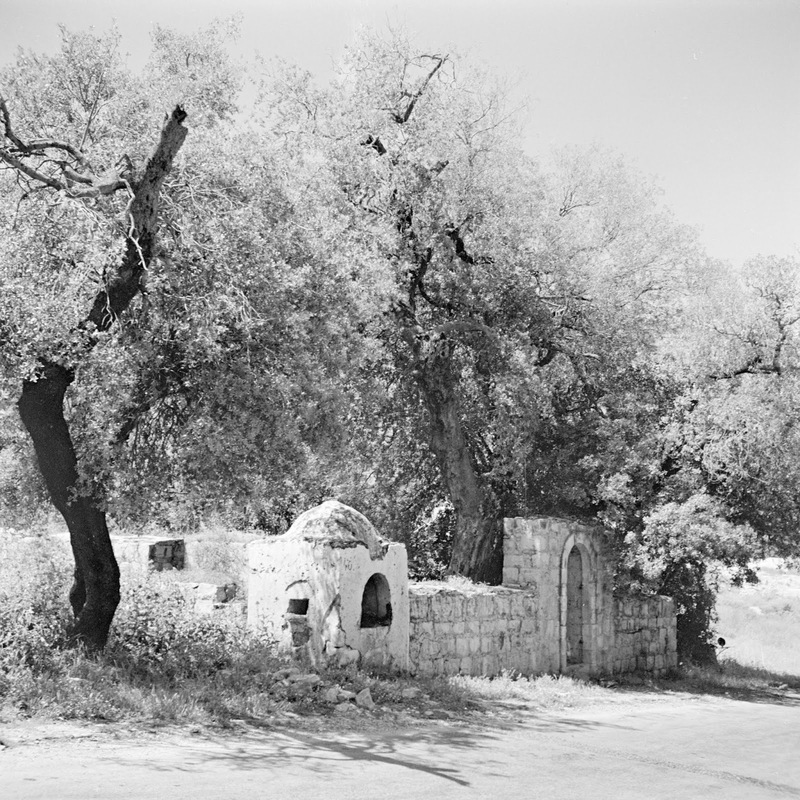 The mausoleum of Mustafa Abu Ghоsh was built on the slope of the hill overlooking the convent and the valley with the village gardens. Some other members of the family were later buried around the mausoleum. The building and its architectural and decorative details represent excellent masonry. 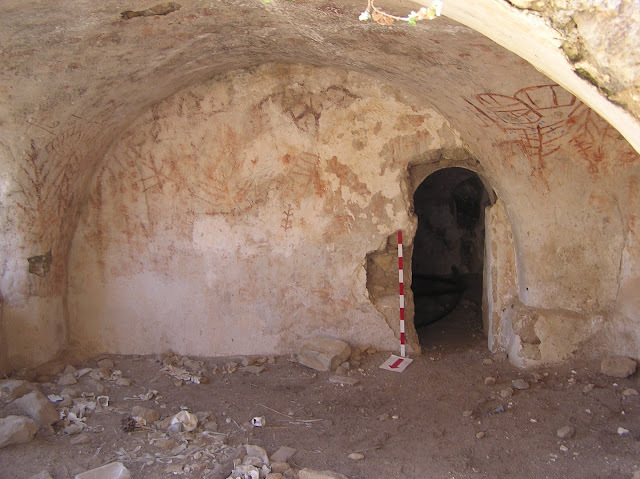 It consists of one square room, about 4x4 m (inside), the interior of which is plastered and painted white, with the large tomb occupying most of its space. The plaster in and around the mihrab was moulded to form decorative elements: a stylized combination of a star inside a crescent in the midst of the mihrab, and over its arch, a rather primitive moulding representing two crescents on spikes flanking a spearhead. 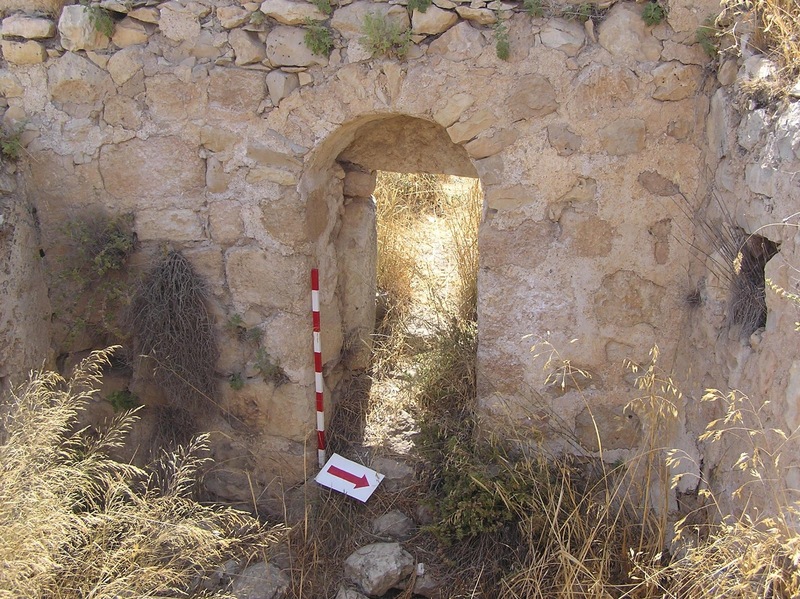 The entrance to the mausoleum is from the east through a gate with a perfect arch, to the left of which there is a little arched window. 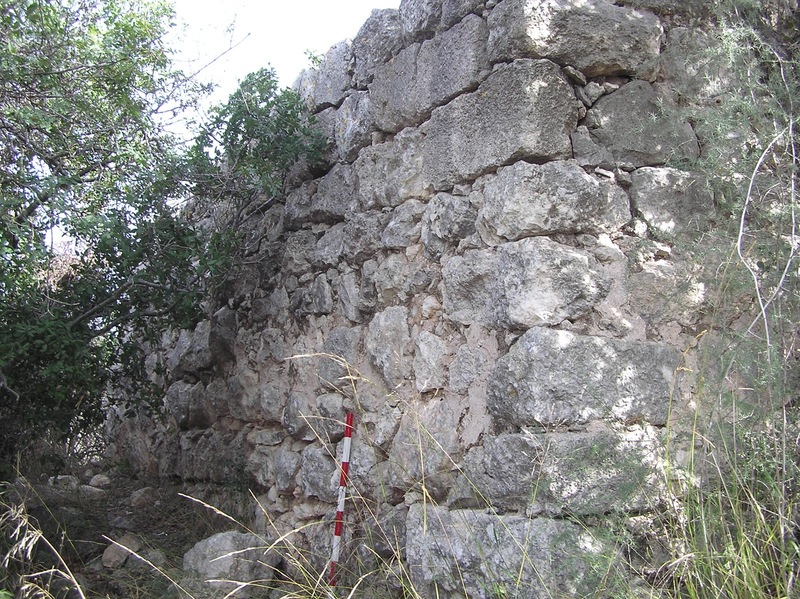 The outer southern wall is the real facade of the mausoleum. 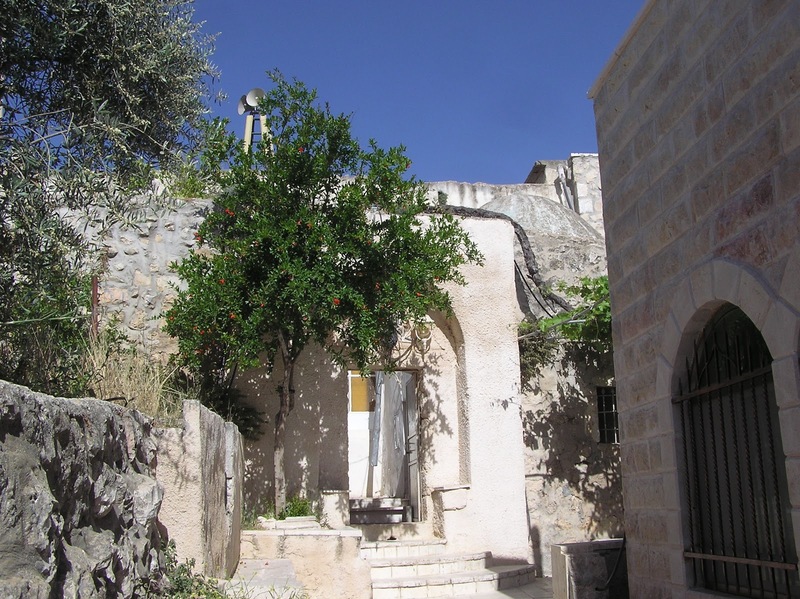 It is carefully decorated with architectural elements: an arch surmounted by a gable, both protruding from the wall. The inscription was placed above the arch, in the gable. 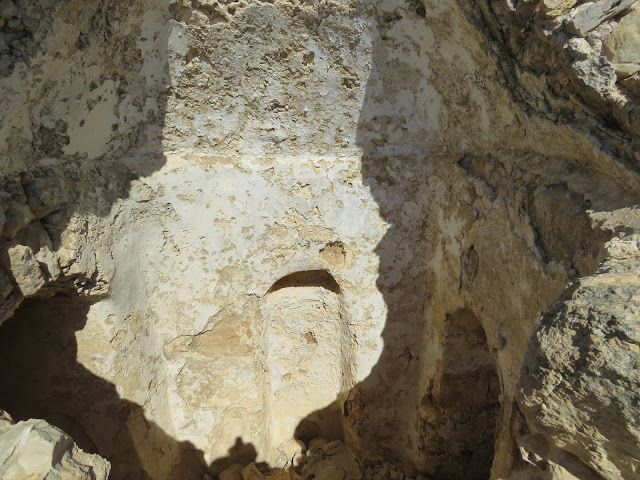 A hole was cut in the wall within the decorative arch, through which only a head can pass, to enable close viewing of the tomb inside. A slab of marble, 0.76 x 0.38 m, placed in a frame. The inscription is a poem; each line, made of two hemispheres, is set in carved fields. Delicate floriated decoration ornaments die right and left margins. 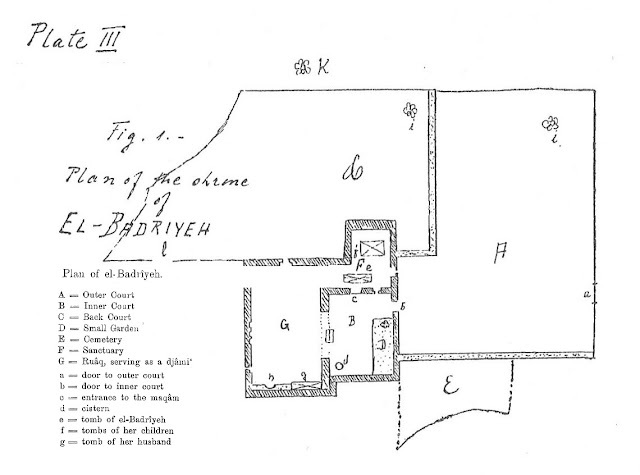 4 lines, Ottoman naskhi; small letters, dots and many vowels; in relief. from Allah our endlessly benevolent Lord. with beverage of clean water, like flowing honey. fragrance, fresh with nobility and love. its date is with Allah in everlasting Garden. 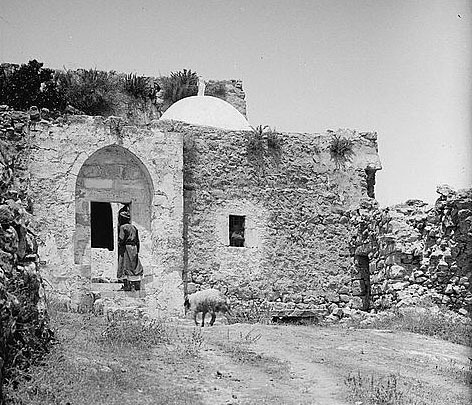 Sheikh Mustafa, who lived in the middle of the 19th century, was a prominent member of the family of Abu Ghosh, they were of Circassian origin. The family controlled the pilgrimage route from Jaffa to Jerusalem, and imposed tolls on all pilgrims passing through. Although on the British maps of Palestine this building is called the tomb of sheikh Salama, there it is speculation that in fact Salamiya, the youngest daughter of sheikh Badr ad-Din al-Jimali, was buried here. 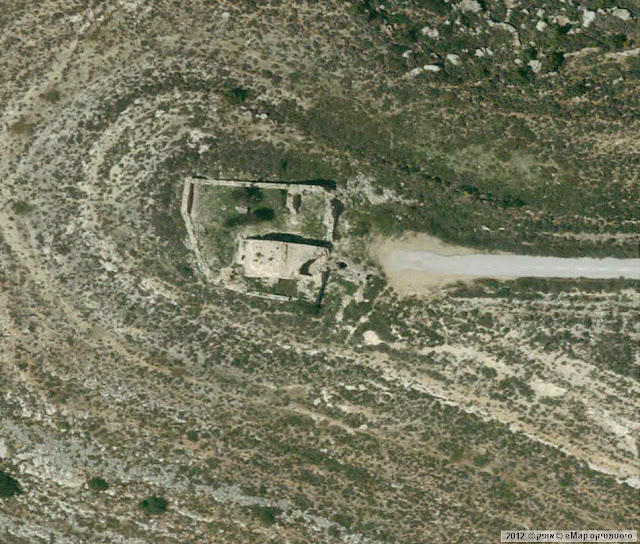 Maqam is located on the southern slope of Mount Eitan, almost at the bottom of the ravine, which is quite unusual. 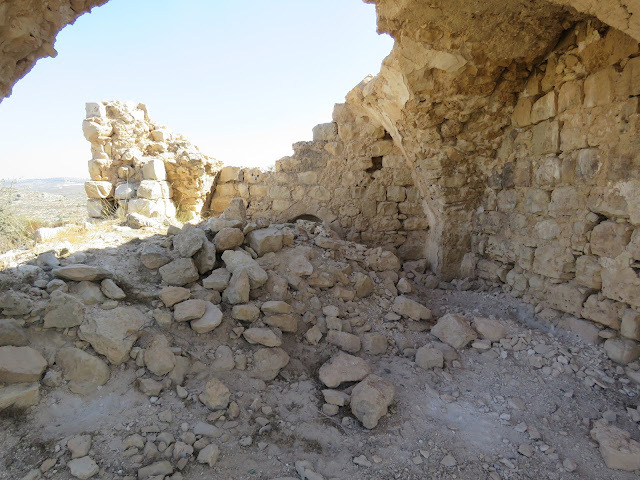 The structure is heavily damaged, it’s only the northern wall with an arched entrance that is left from it. 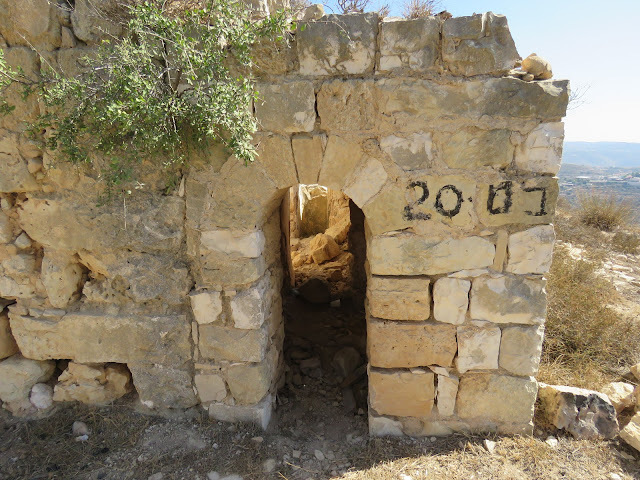 W. Khalidi attributes this shrine to the former Palestinian village Khirbet al-Lawz, which was situated on the top of the mountain (1992, 300). Route. The maqam is fifty meters away from Route 386 (the junction between the power plant and the sewage treatment facility), but it is hidden behind the trees, and it was not easy for us to get there because Mount Eitan has steep slopes. There are no paths of any kind. 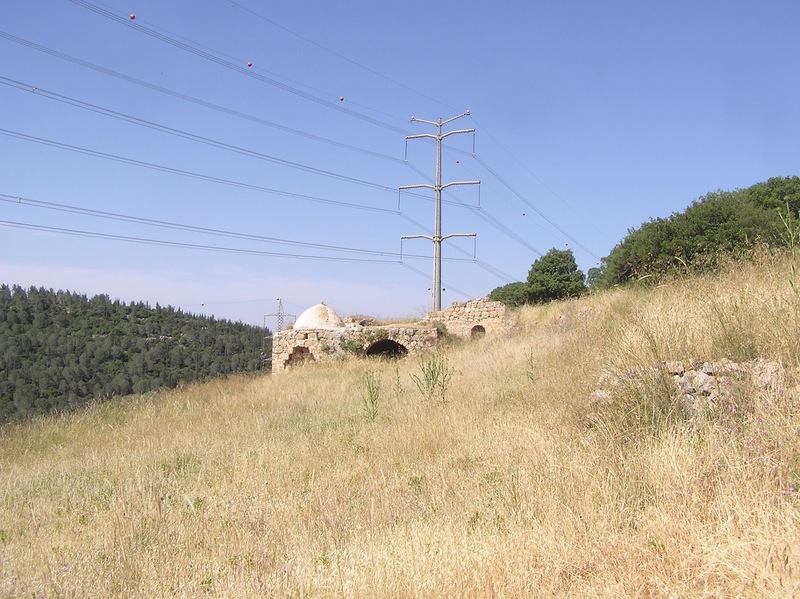 But the maqam is accessible from the road 4x4, which goes around Mount Eitan from the Sataf road junction. In Islam, as well as in Christianity (as opposed to Judaism), the cult of “holy women” – female scientists, prophets and healers – is highly developed. In Palestine there are many maqams dedicated to outstanding Muslim women. The status of these women was equated to the status of sheikhs, that’s why they are often called sheikhnesses. 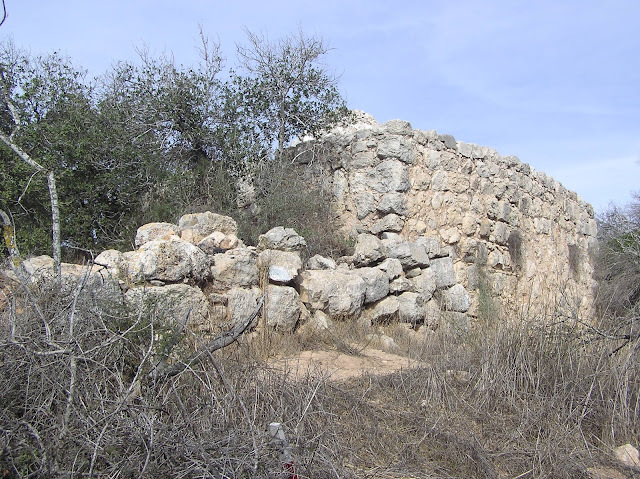 The three daughters of sheikh Badr ad-Din al-Jimali – Badriya, Humaidiya and Salamiya – were such cult figures. 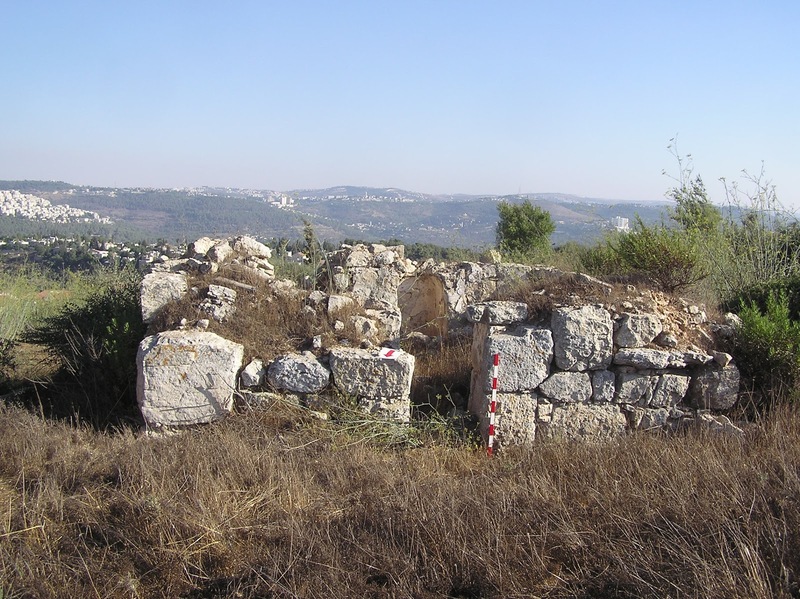 After their deaths sheikh's daughters were buried near three important roads which lead to Jerusalem since ancient times and thus "protected" the holy city of the Muslims. 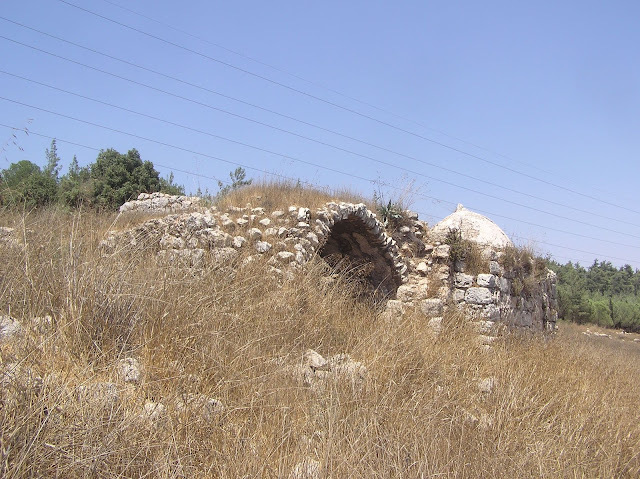 Humaidiya tomb is located in Gush Etzion. 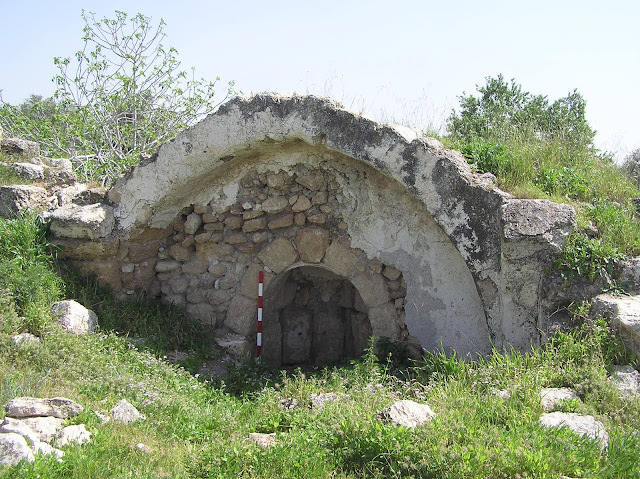 The location of the Salamiya’s tomb is not determined precisely; probably, it corresponds to the Maqam sheikh Salama (see above). Badriya died when her father was still alive and all the family still lived in the Sherafat village. Her tomb is situated in this village, to the south of Jerusalem, and is a part of the complex of a functioning mosque. 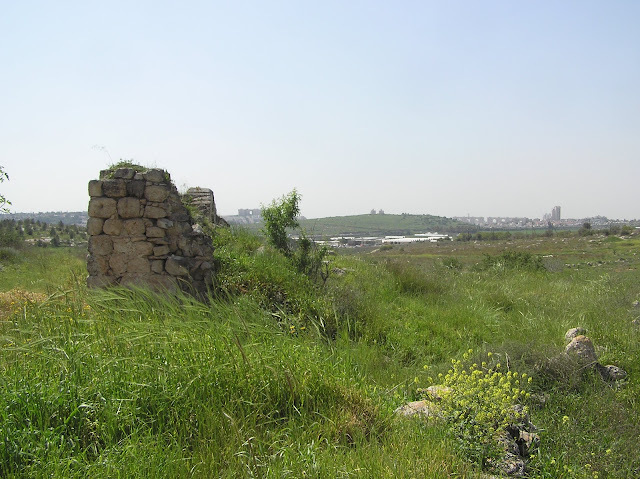 Residents of Sherafat faithfully cherish the memory of sheikhness Badriya. According to the custom, her cenotaph is covered with goldweave cloth. 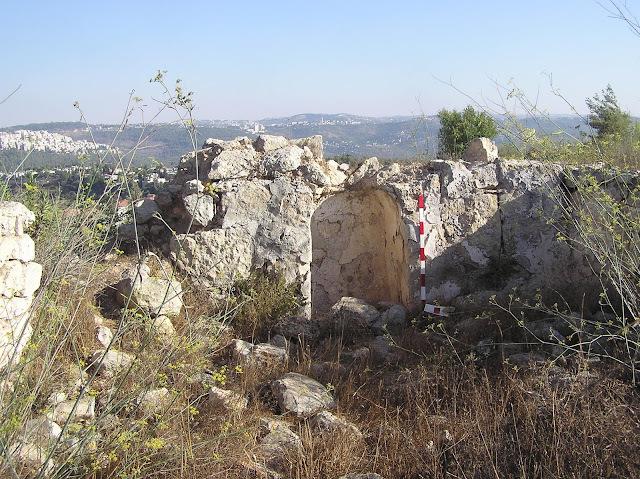 “In al-Badriyeh, — says T. Canaan, — one tomb in the shrine itself is said to be hers, the other to the north that of her children, while the tomb outside her shrine is believed to be that of her husband. 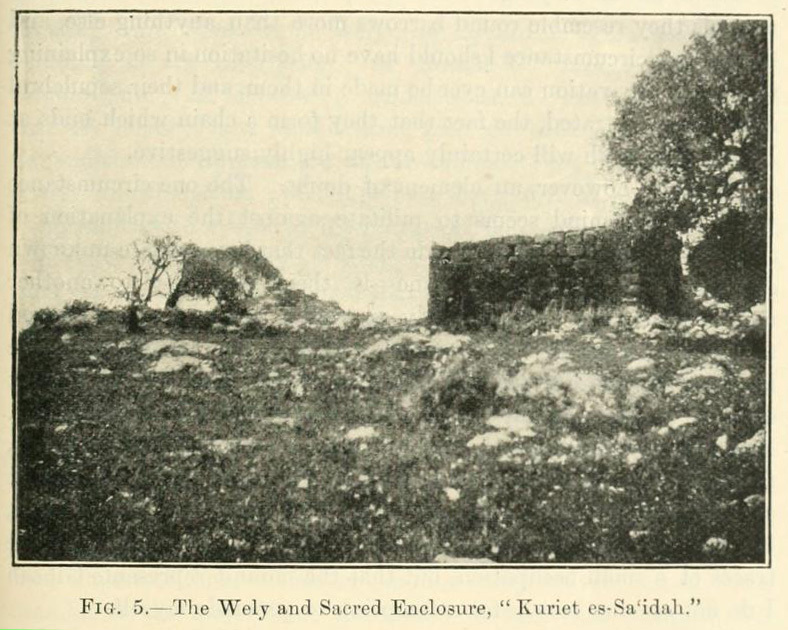 The caves below the shrine of es-sitt al-Badriyeh (Sarafat) are used for storing straw (tibn).” (1927, 23, 43) Badriya’s husband name was Ahmad at-Taiyar, he was her cousin, and afforded the honor of being buried near the famous couple. 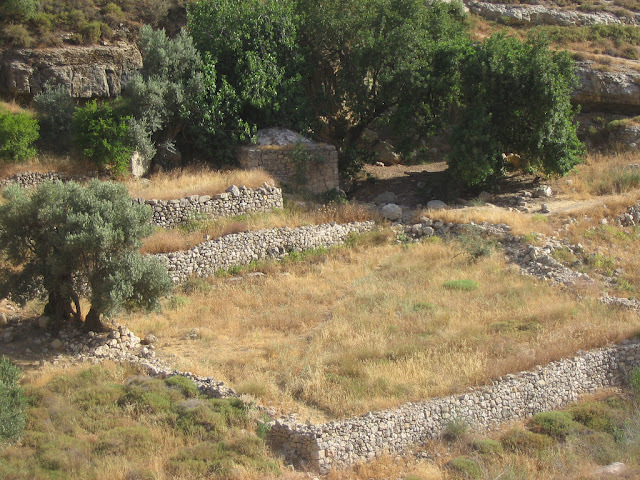 Their children, about whom we now know nothing, were also buried in the religious complex. 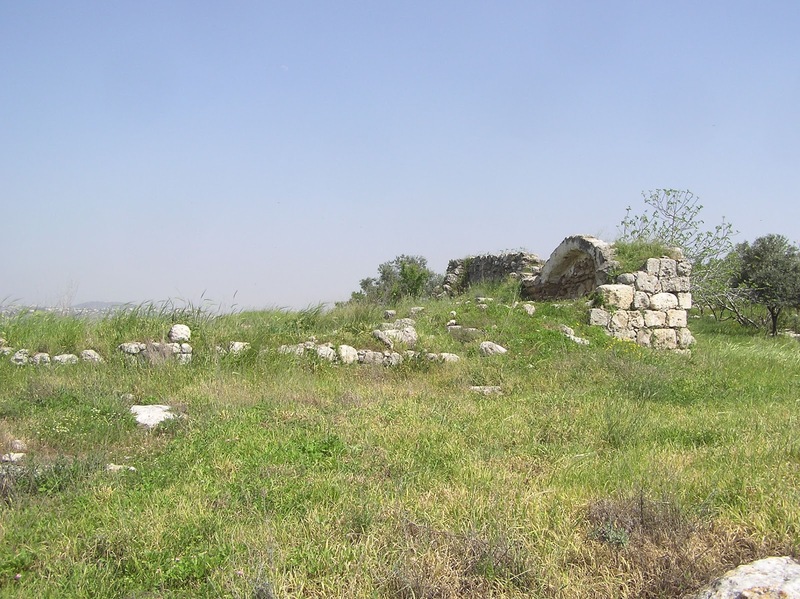 No less is the glory of the five sisters of the village Bir Ma'in sheikh (or nabi): Hannaya, Zahra, Mana, Huria and Farha. 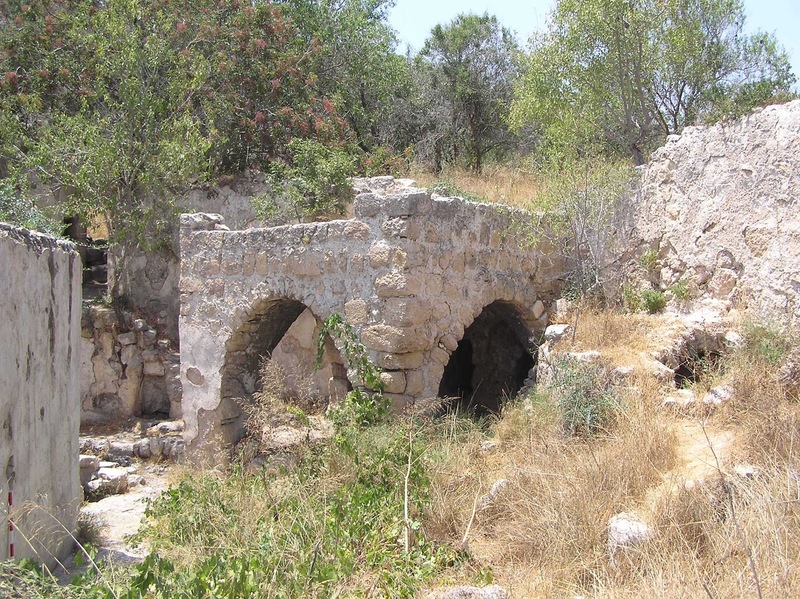 They were revered as holy women and called respectfully Sitt-na, “Our Lady.” When sheikh of Bir Ma'in died, his sister hurried to come from Jisr Benat Yakub, or “Bridge of the Daughters of Jacob,” which is on the Jordan to the south of Lake Huleh, in order to be present at his funeral. 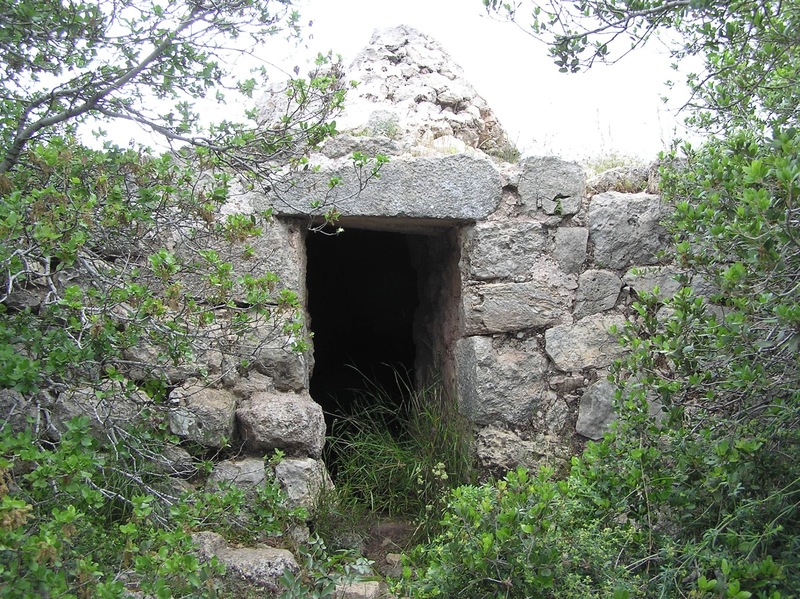 They all however died before reaching their destination, at different places in the neighbourhood, where their tombs are still the object of veneration (Clermont-Ganneau, ARP II 78). 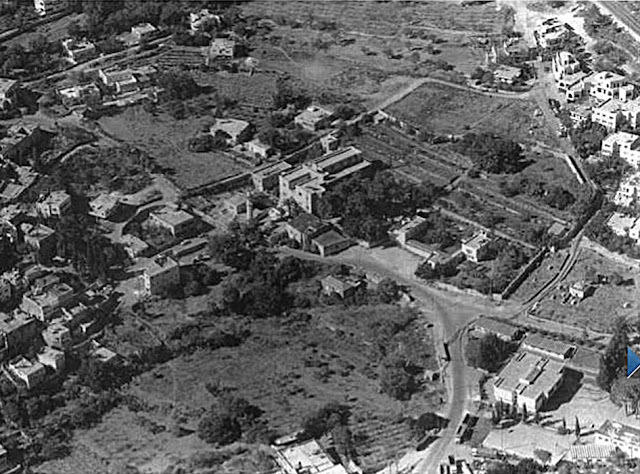 Nowadays where once was Bir Ma'in lies Israeli town Modi'in. Only two out of five tombs survived: Mana’s and Huria’s. “Kabr Sitt Mana” — “The Tomb of Lady Mana” is situated twenty meters away from the Highway surrounding the Modi'in. 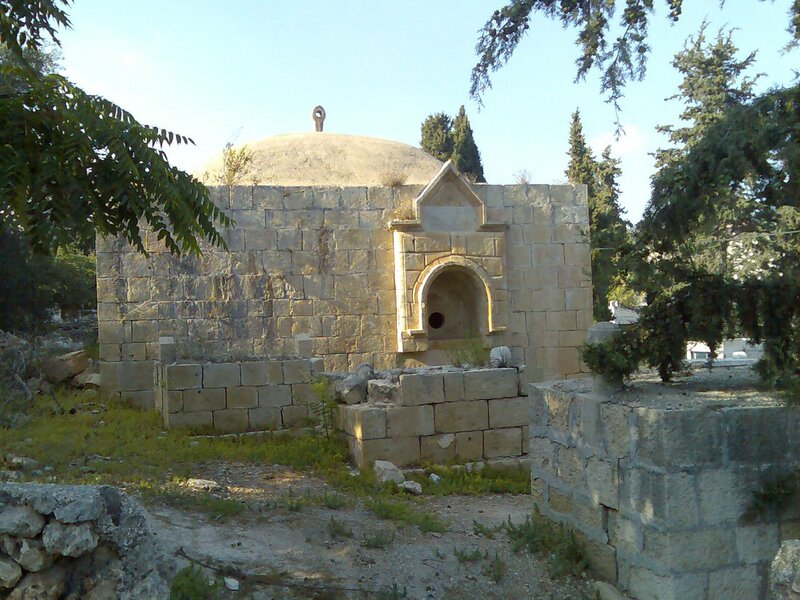 Its dimensions are modest: 4.00 x 3.85 x 1.50 m with a 0.40 m tall dome. 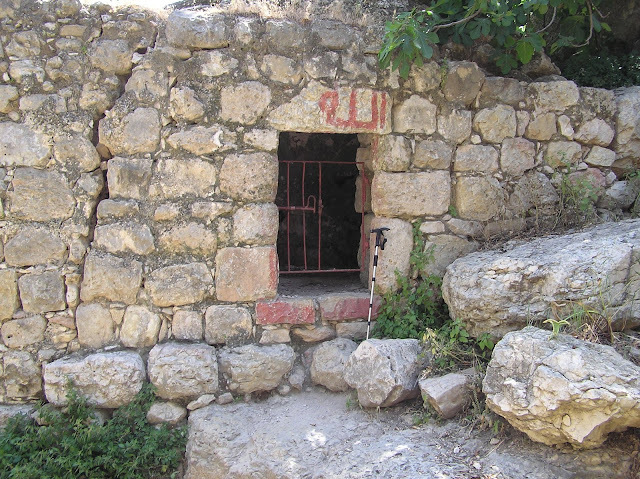 The entrance to the tomb is only one meter high, one has to bend in order to enter. 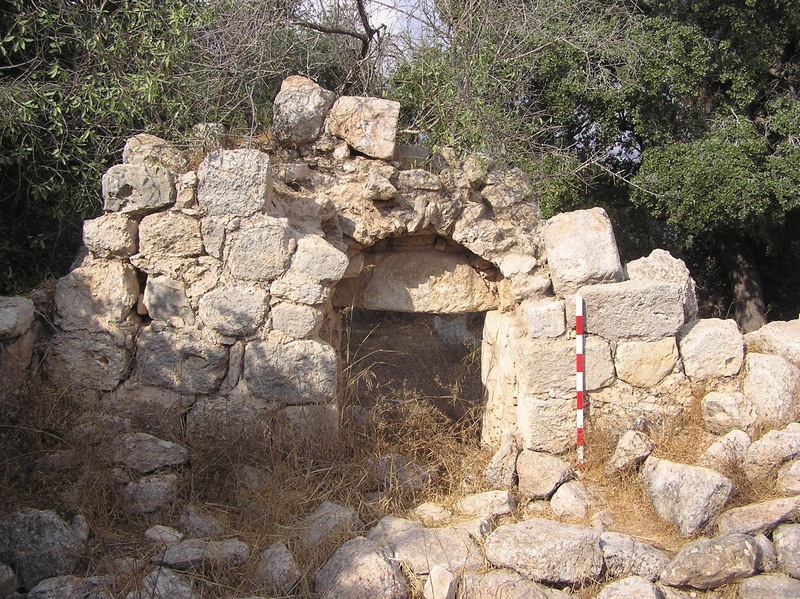 Mihrab is in the southern wall, the dome is partially destroyed. Now the maqam is abandoned, violently growing grass threatens to engulf him completely. 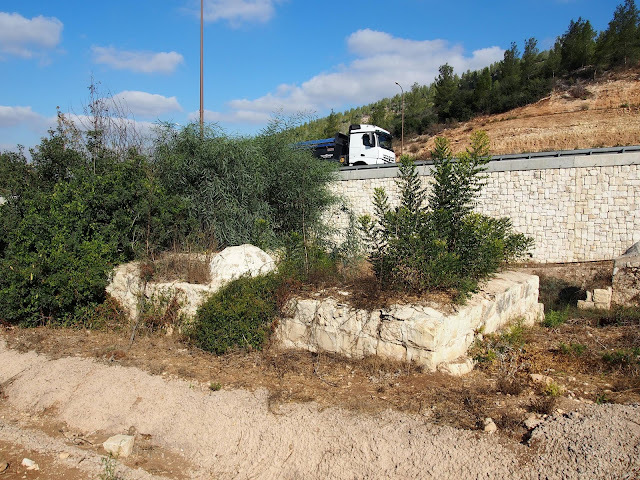 One hot July day, we were driving along a semi-asphalted road from the Shilat road junction around Kfar Ruth moshav till we came to rest against the security fence that now separates the Israeli from Palestinian Arabs who live on the “territories”. 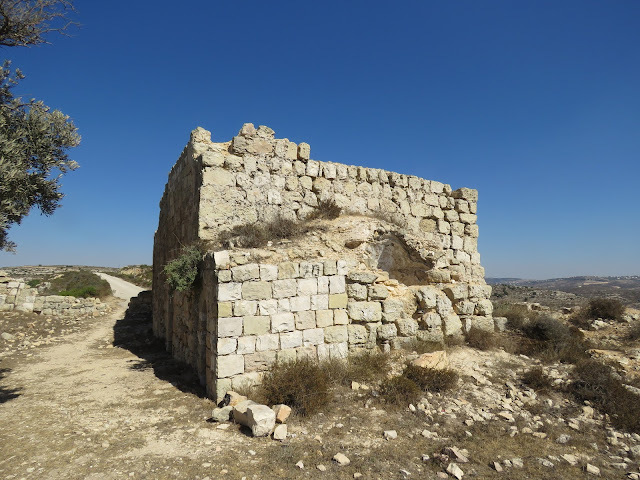 Here we got out of the car and found ourselves standing on the ruins of a Palestinian village, part of which stayed on Israeli territory; and the other part was over the fence. On the Israeli side – the remains of a Byzantine monastery and a former Muslim shrine – the tomb of lady Huria. 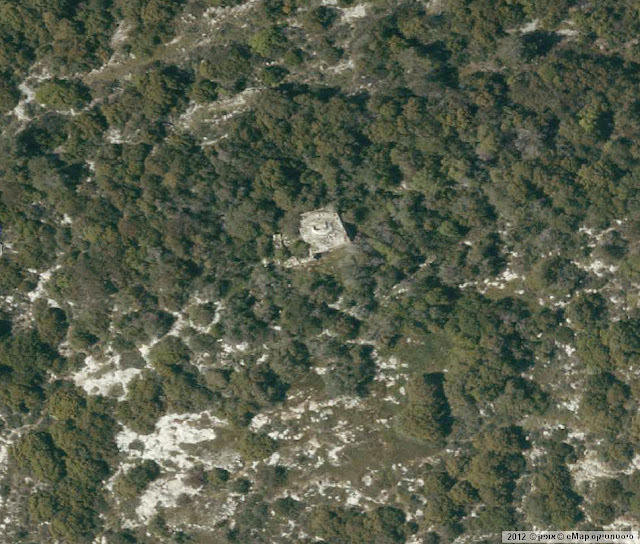 C. Conder was here in April 1873 and even then he saw only the ruins (SWP III 103). 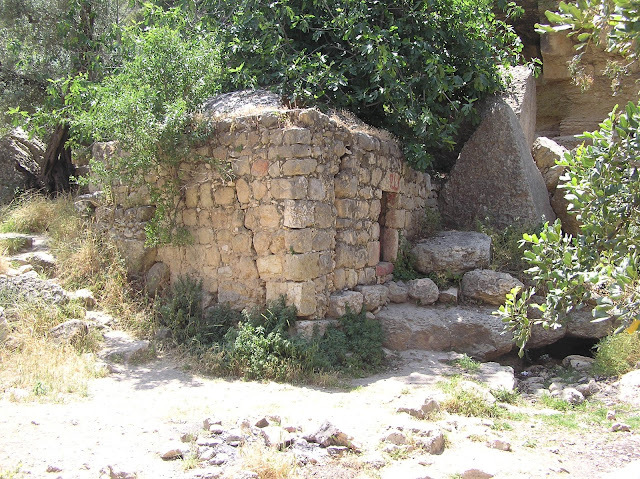 He calls the ruins of the maqam al-Huriyeh or Umm Rush. In December, 1917 during the Palestinian campaign the troops of general E. Allenby conquered al-Burj settlement which was located in the northern part of the present Modi'in, on Giv‘at Titora. 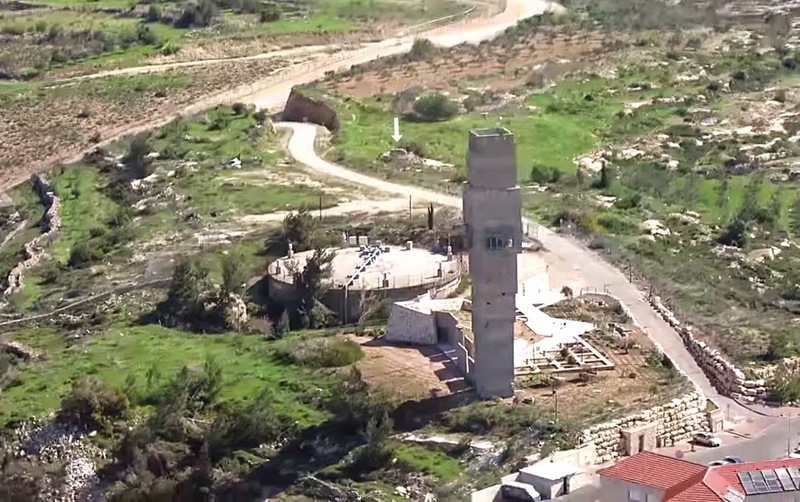 The Turkish troops retreated and consolidated at altitudes to the north-east of al-Burj. 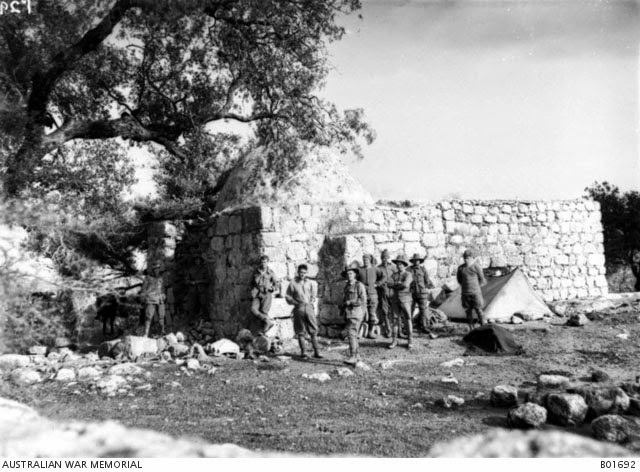 One Australian brigade advanced against them, the photographer of which, inter alia, captured Maqam sitt Huria. This is how it looked like in January, 1918. 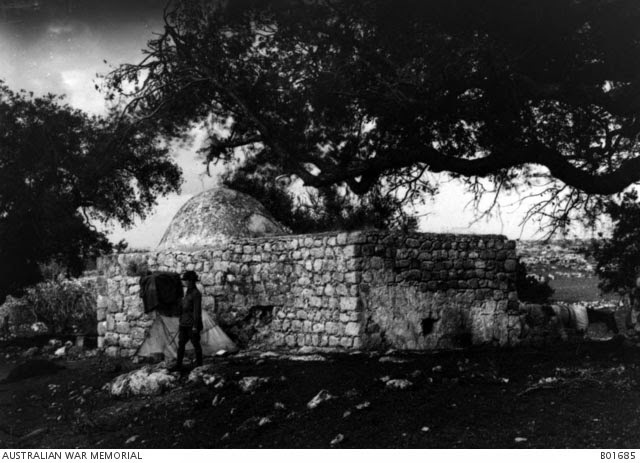 In the photo collection of the Australian War Memorial this maqam is called “the Old Mosque at Al-Burj” but its location (not in the middle of the settlement but among the ancient ruins), dome, typical protrusion in the southern wall and some other peculiarities leave no doubts that we see exactly the building, the remains of which are now located in Khirbet Kafr Ruth or Umm Rush. Judging by photographs of 1918, an entrance to the maqam was from the western side where there was a wide arch. 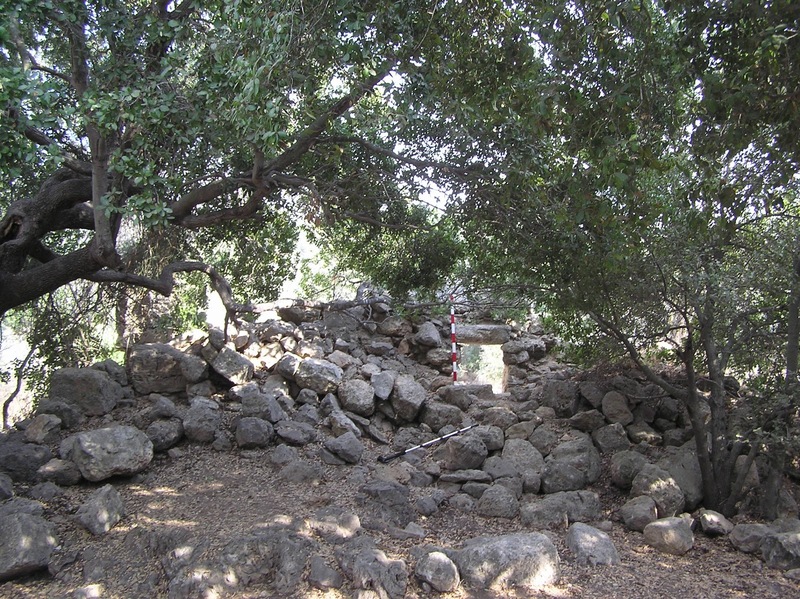 At present only a southern wall with a mihrab remained from the maqam. All the rest is completely destroyed. What is the meaning of the red signs on the walls? Drawings of geometric shapes which look like plants. Черт знает, что там кто чертит! А вообще любопытно. В других гробницах я такого не встречал.